A rare patch of sunlight cuts through the mist on Saturday morning. 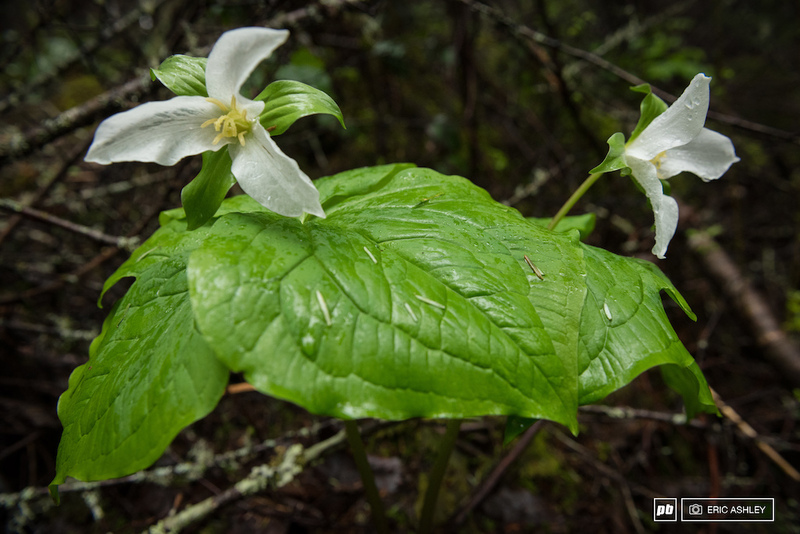 The old adage holds that April showers bring May flowers. 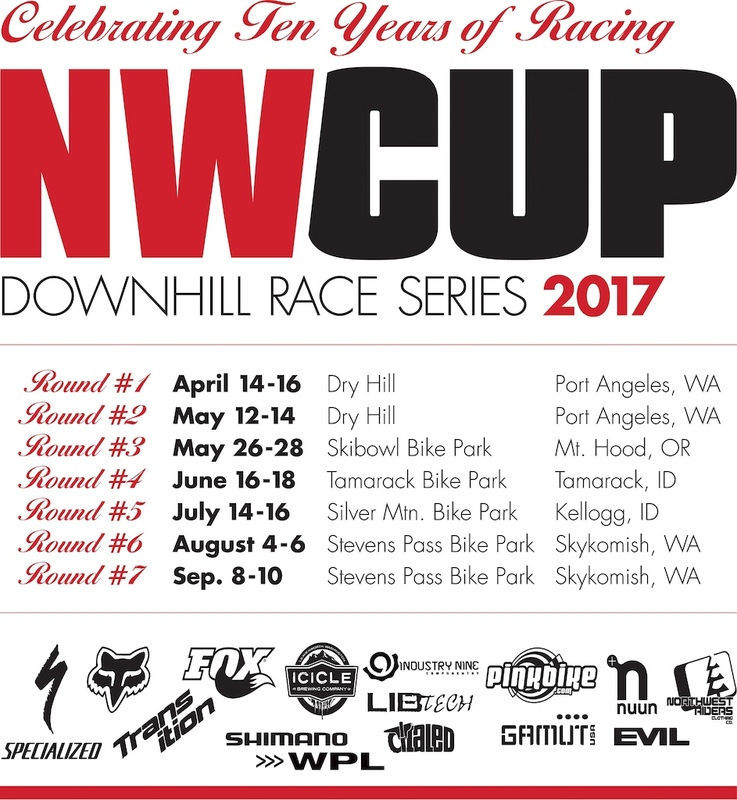 But in “Always Sunny Port Angeles,” April showers just brought May showers for the second stop of the NW Cup and Pro GRT. 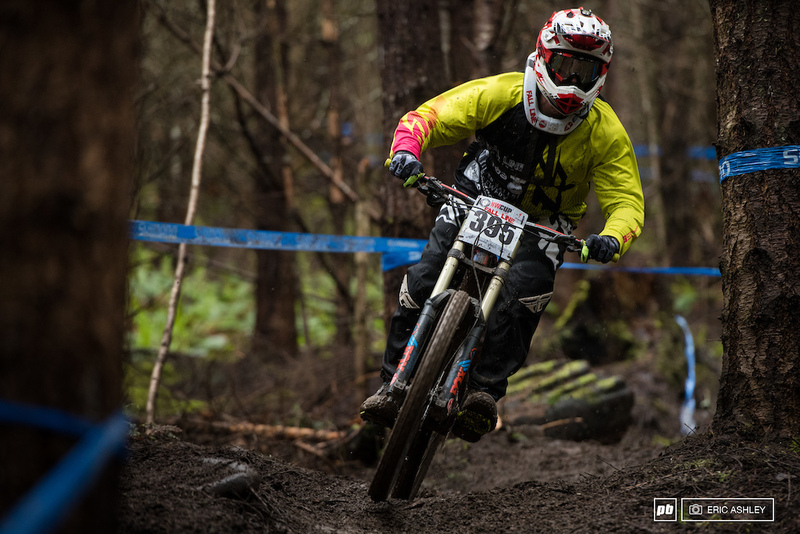 But with a huge turnout of over 500 racers and a deep pool of talent, there wasn’t much the rain could do to dampen the weekend. 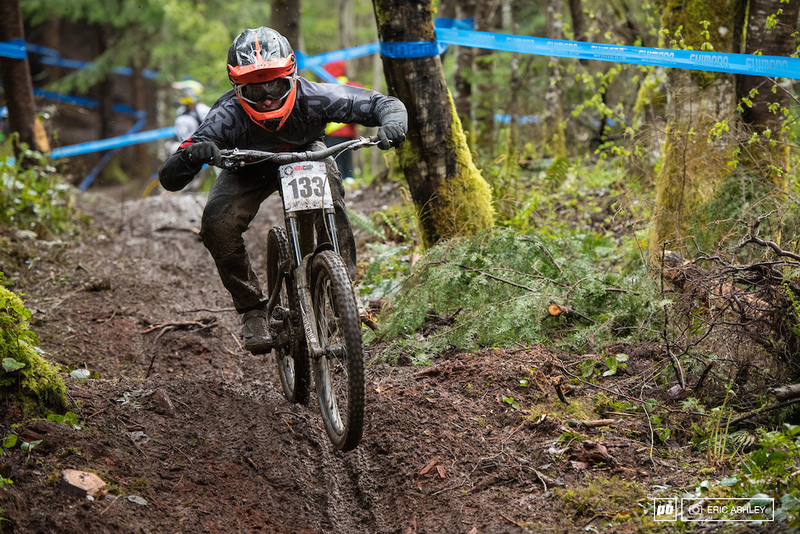 Mitch Ropelato battled through a muddy course on Sunday to take the win at Port Angeles (Pro Men). 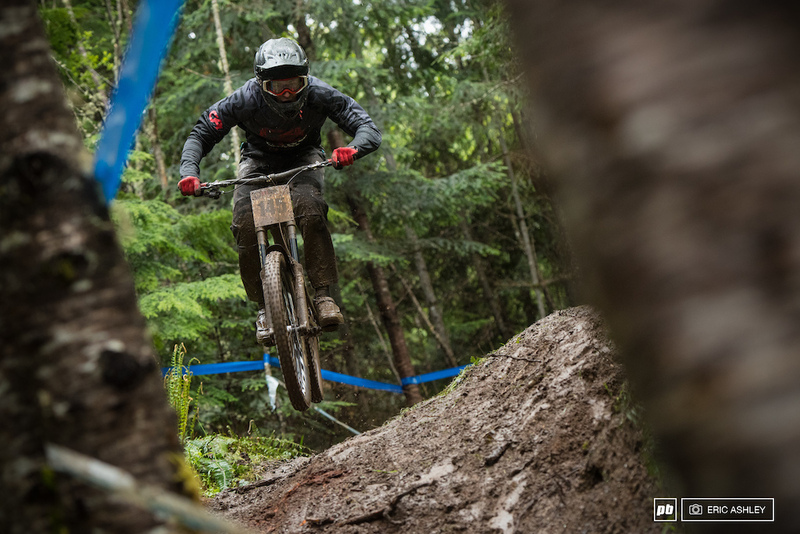 The courses tied together time-honored signature features and even introduced a new patch of loam named Rekluse, that quickly turned into a mud-fest. 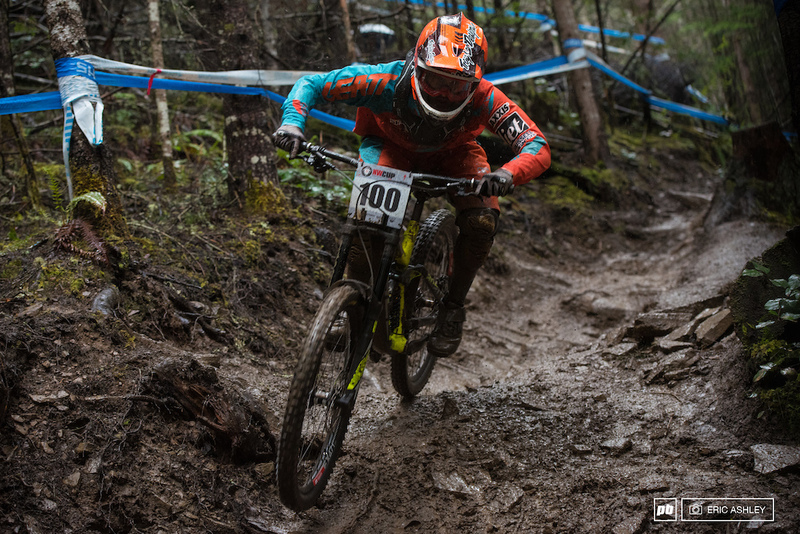 Conditions alternated between drizzles, a spot of sun, even some hail on Friday, and a torrential downpour for Junior and Pro races on Sunday. 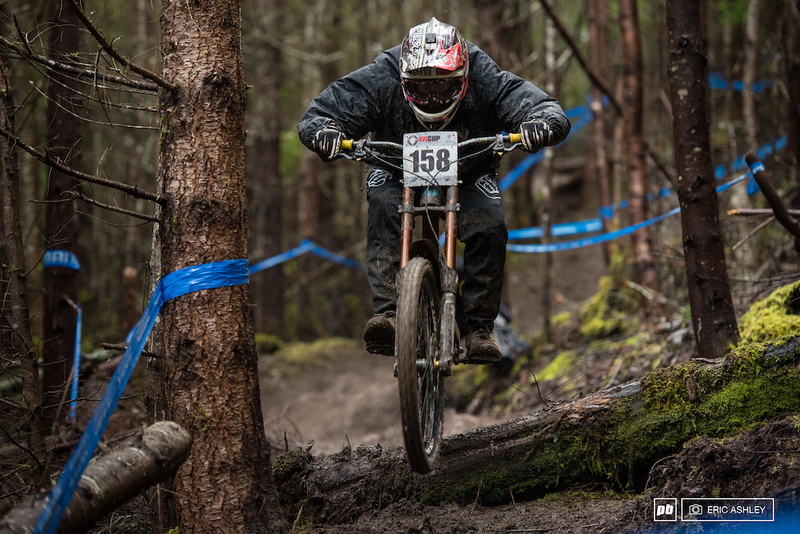 Racers did their best to roll with the changes by extending visors, wearing ponchos and trash bags, and just generally making do with the slick conditions. 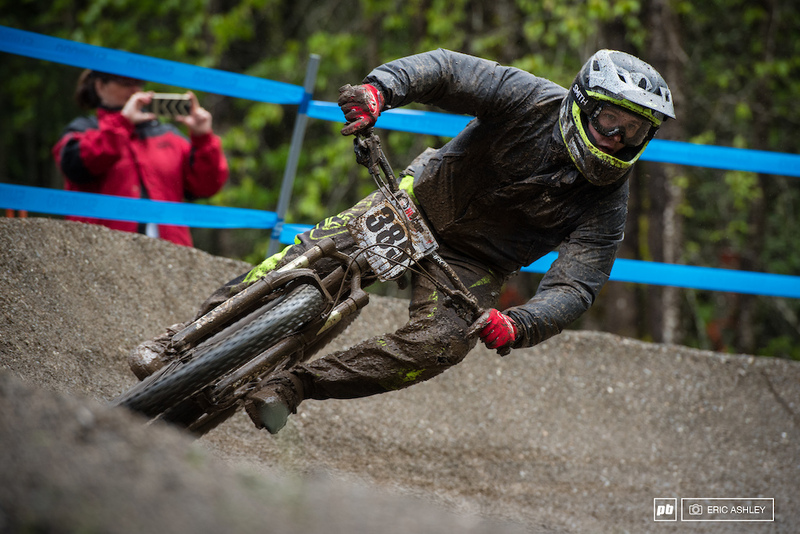 A damp and muddy Johnny Pownall rounds the finishing berm during Saturday morning's practice (Cat 2 Men 15-18 ). 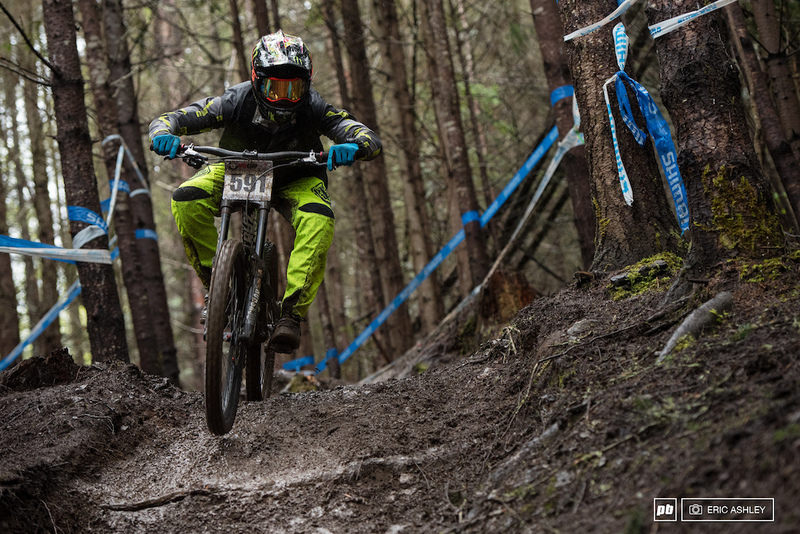 Saturday's practice for Juniors and Pros was pretty brief but most racers still managed to slam through some laps before seeding. At the end of the day, Lucas Cruz led Devin Kjaer, Blake Bunting, Ethan Shandro, and Kendal McLean. 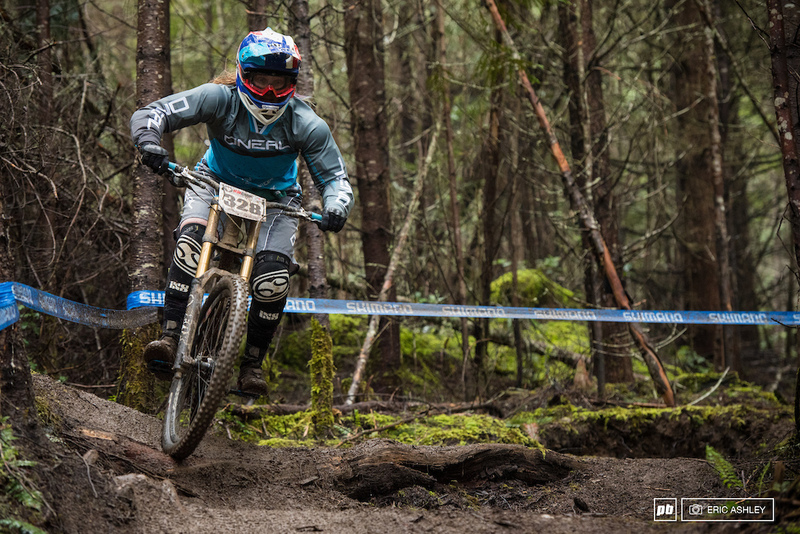 Jill Kintner had a clear lead over the competition including Canada's Vaea Verbeeck and Australia's Danielle Beecroft. 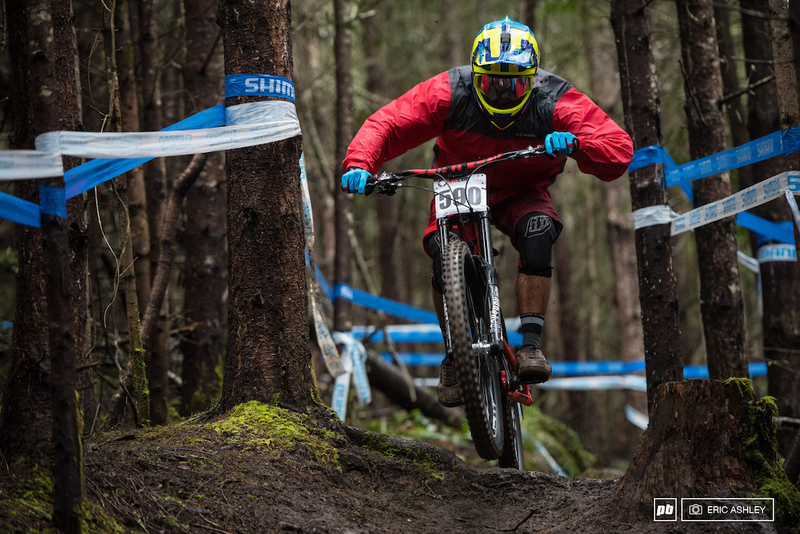 Luke Strobel set the pace for Pro Men ahead of Kirk McDowall, Kiran MacKinnon, Carson Eiswald, and Mitch Ropelato. 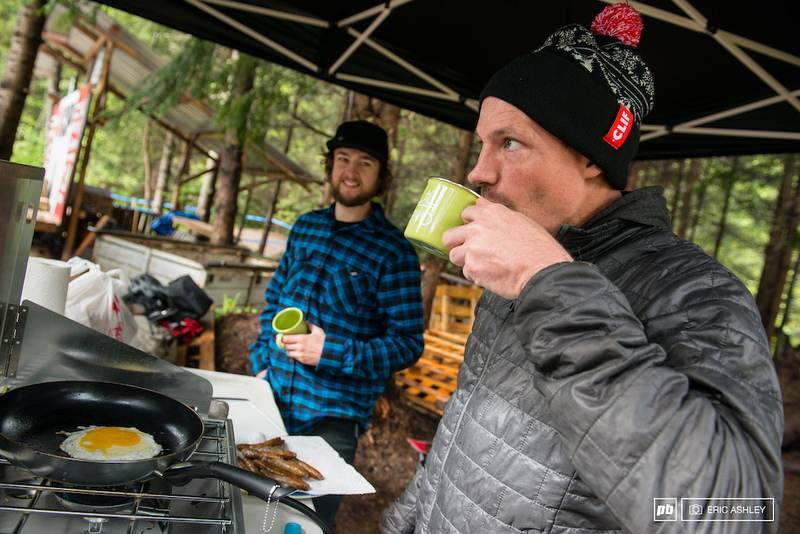 Lars N' Bars was on site with his Loam High bus and a mean set of breakfast preparation skills. 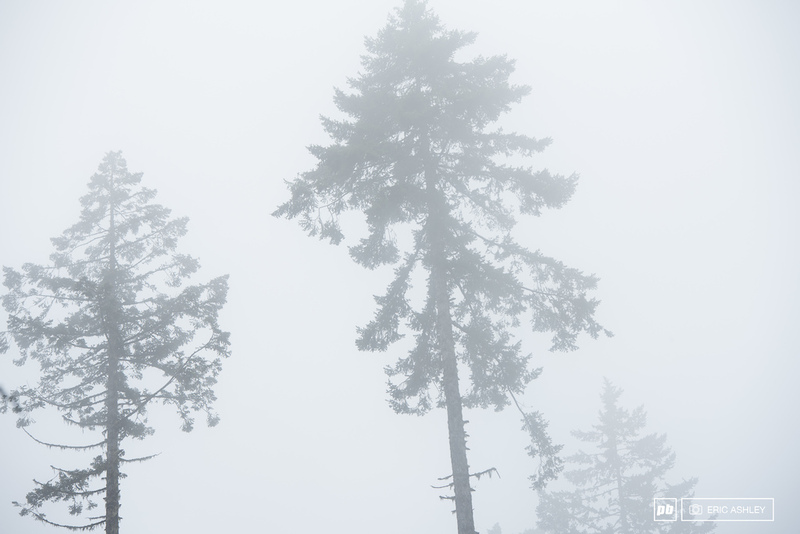 The next morning, conditions stayed pretty tame as Categories 3, 2 and 1 completed their runs. The same can't be said for the Junior and Pro practices which were accompanied by a hard rain that just magnified the channels of peanut buttery mud. This was especially evident in Reckluse where some of the ruts were starting to reach to the rotors. 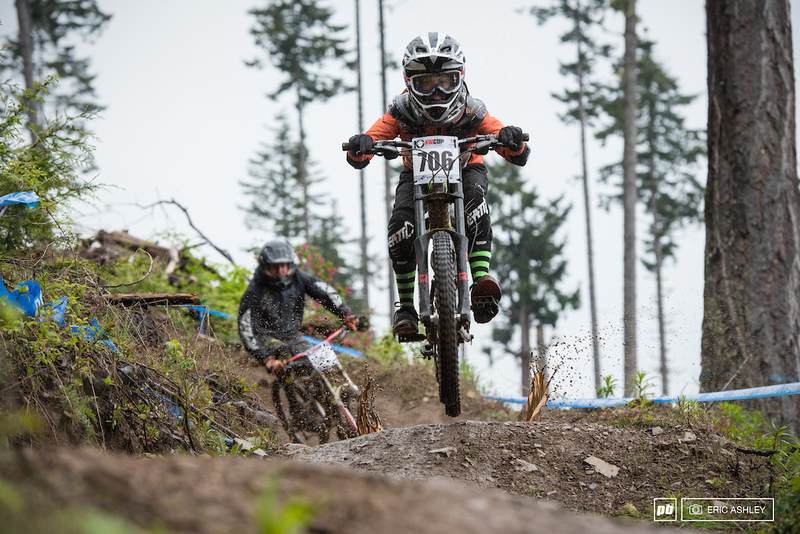 Ethan Shandro battled his way to the top to unseat teammate Lucas Cruz with a time of 2.40.70. 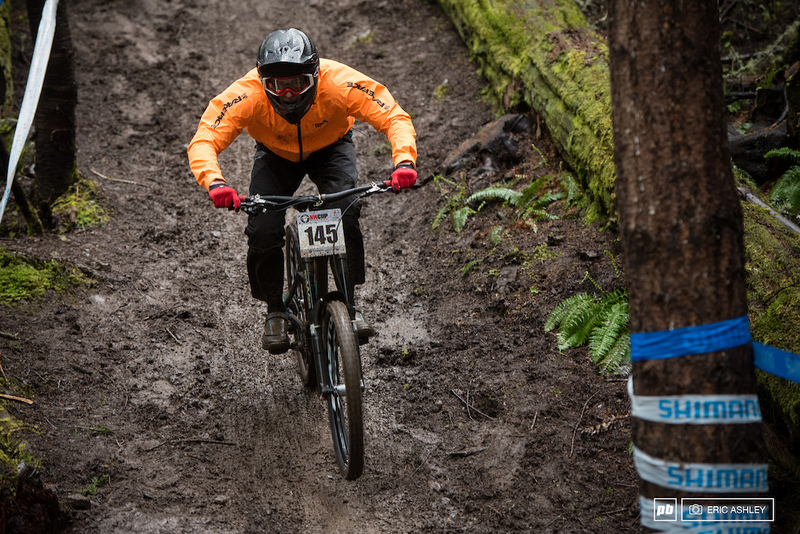 Jill Kintner powered through the slop and found nearly five seconds, putting her well at the lead. 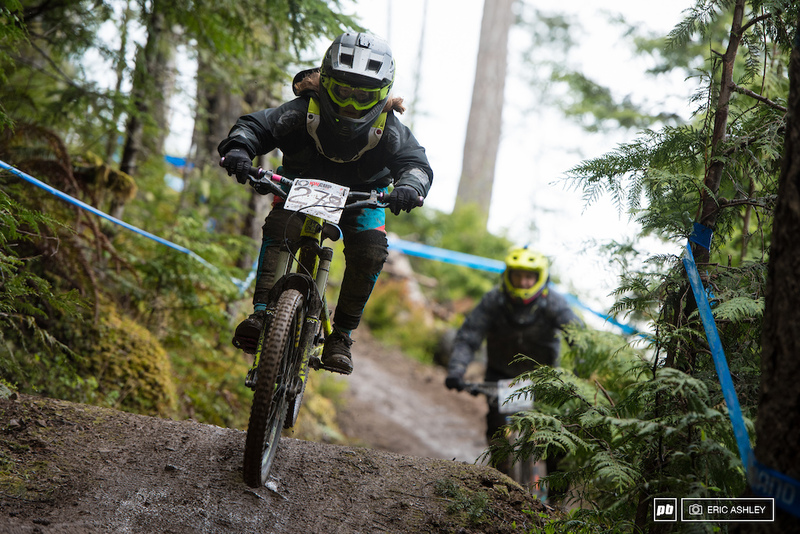 In the coming weeks, the Bellingham local will be checking out Whistler's opening weekend and getting ready for the upcoming US Open. 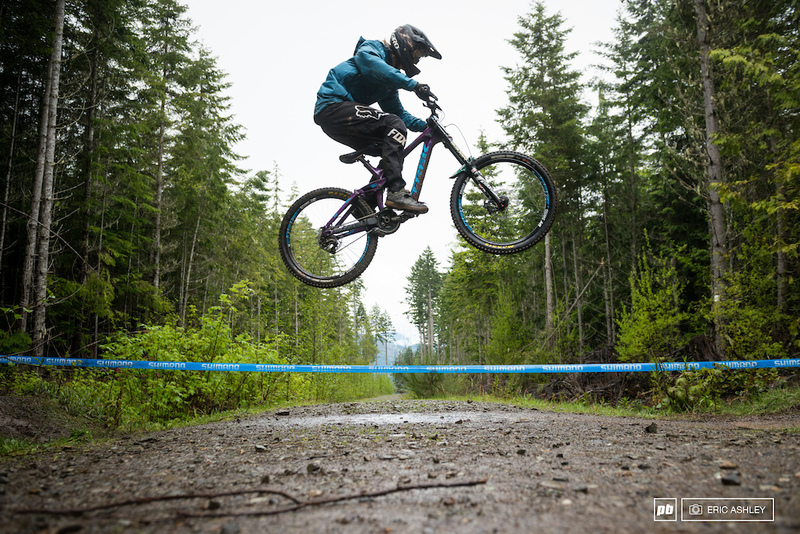 She'll also be spending some time working on the freshly minted pumptrack she partnered with the WMBC to bring to Bellingham. Mitch Ropelato delivered a smooth run and turned in a burst of speed that saw him surge up five spots for the win. 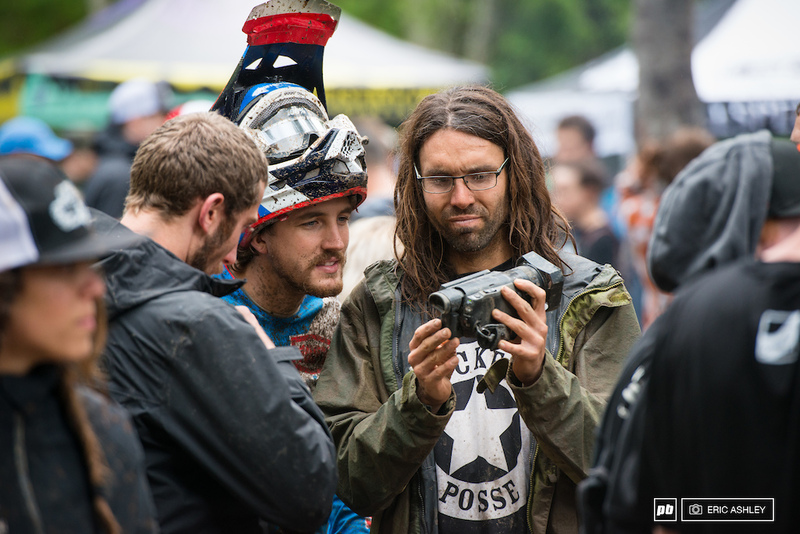 Following Ropelato was Magnus Manson, Austin Warren, Luke Strobel, and Kiran MacKinnon. 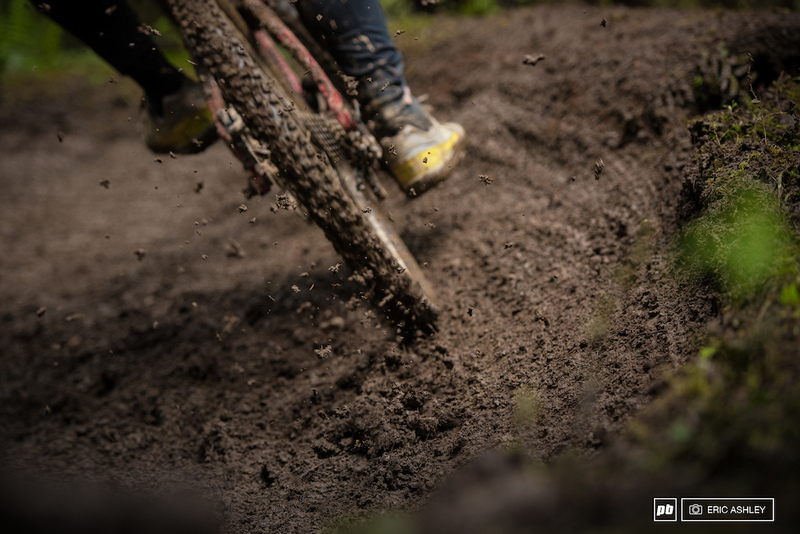 Ropelato will also be spending some time enjoy the riding near home for a favorite local Utah race. Check out the full results here. 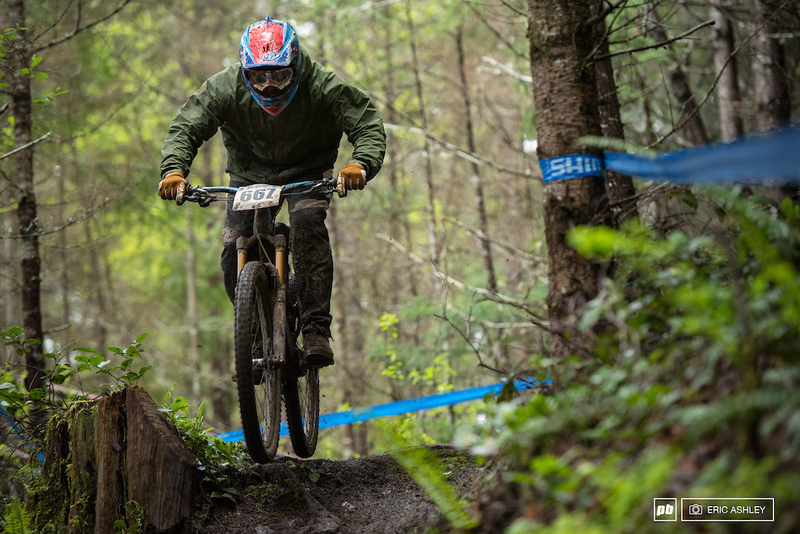 If you missed the mud-slinging fun of stop two, the Pro GRT heads to Beech Mountain Resort in June while the NW Cup stays a little closer to home with a stop at Ski Bowl in two weekends. 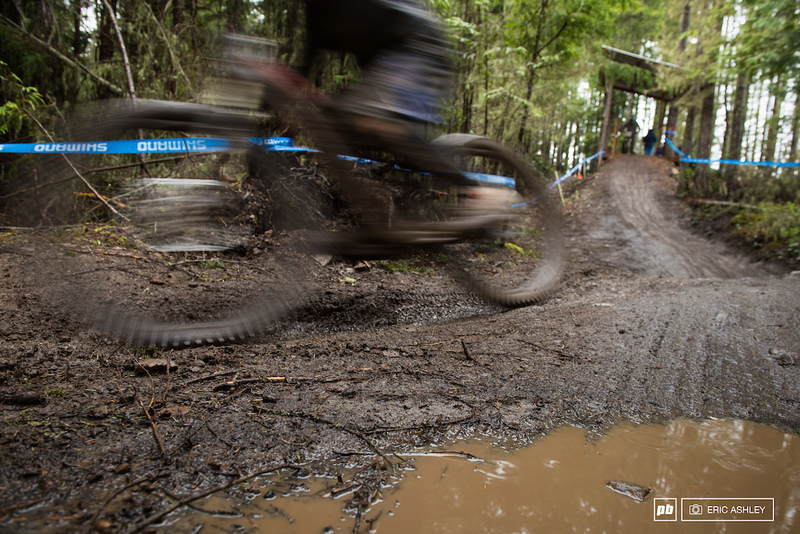 Plenty of puddles on Saturday were apparently a reduction from what greeted racers the day before. The customary NW Cup ride to the top is a little softer for the passengers in the cab of the Uhaul. 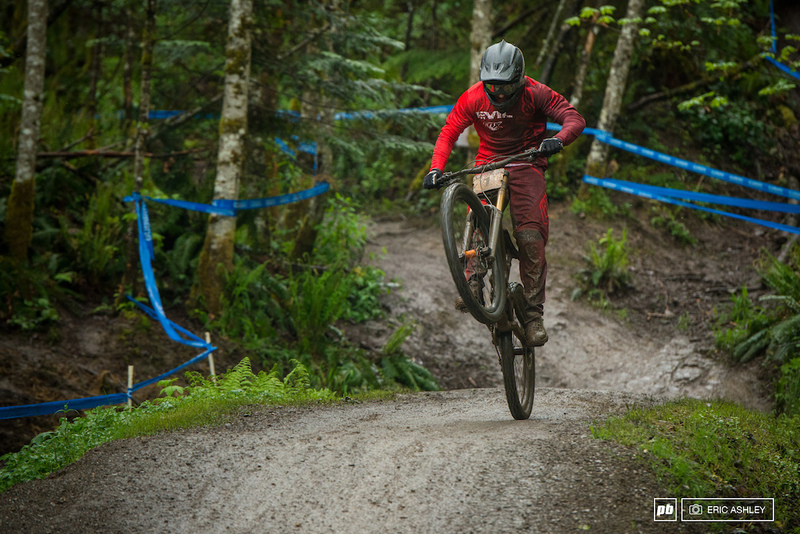 West Coast Racing's Mitchell Schmidt makes a clean turn on Wayne's World (Cat 2 Men 50+). 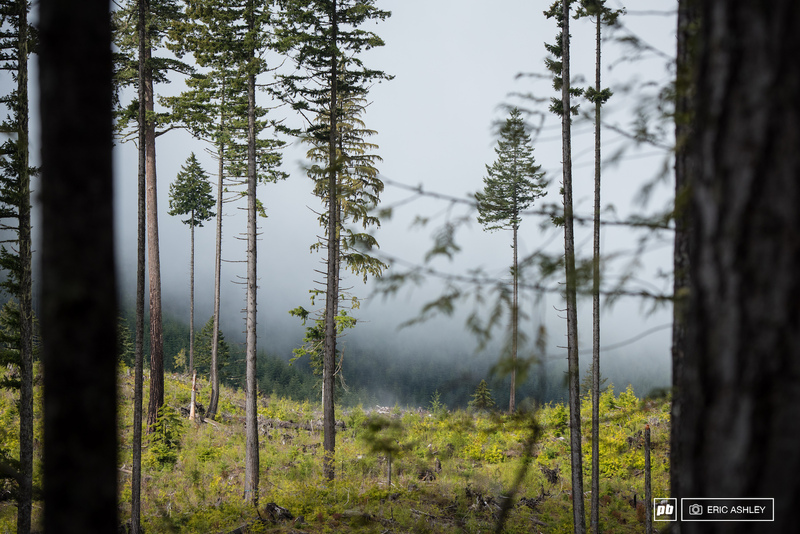 Braden Delzer heads into the top of Wayne's World. Delzer recently catted-up and is quickly finding his pace this season (Cat 2 Men 0-14). 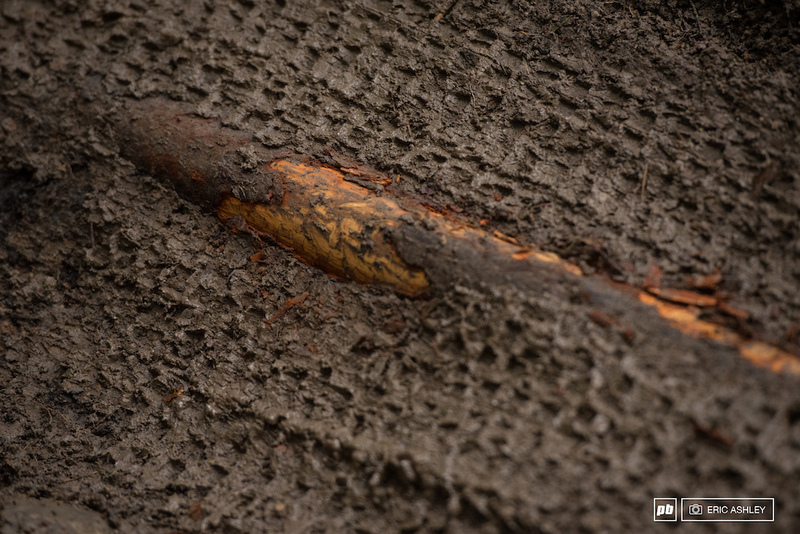 Robert Kans pops a low slick log that occasionally caught racers unprepared throughout the weekend (Cat 2 Men 15-18 ). John Draskovic had no time for dodging puddles, a policy that no doubt helped him take third over the weekend (Cat 3 Men 19-39). 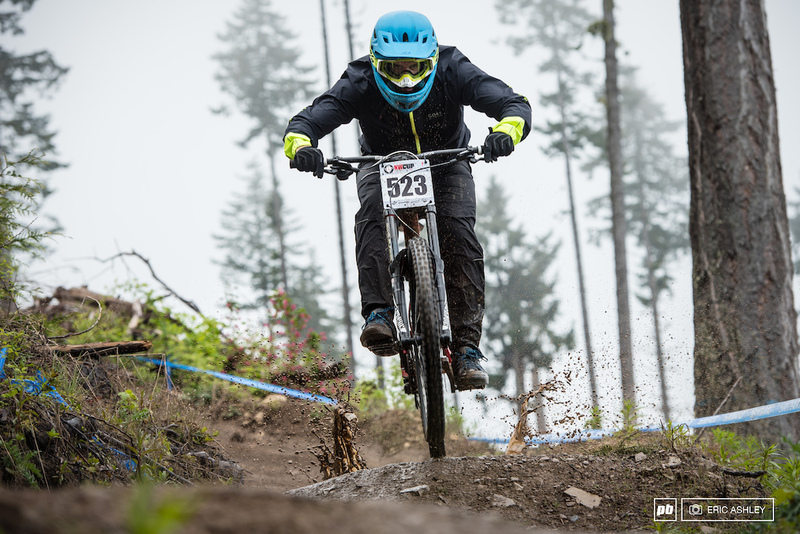 Taylor Ostgaard took the same approach to puddle stomping and also finished third on Sunday (Cat 3 Women 11-18 ). 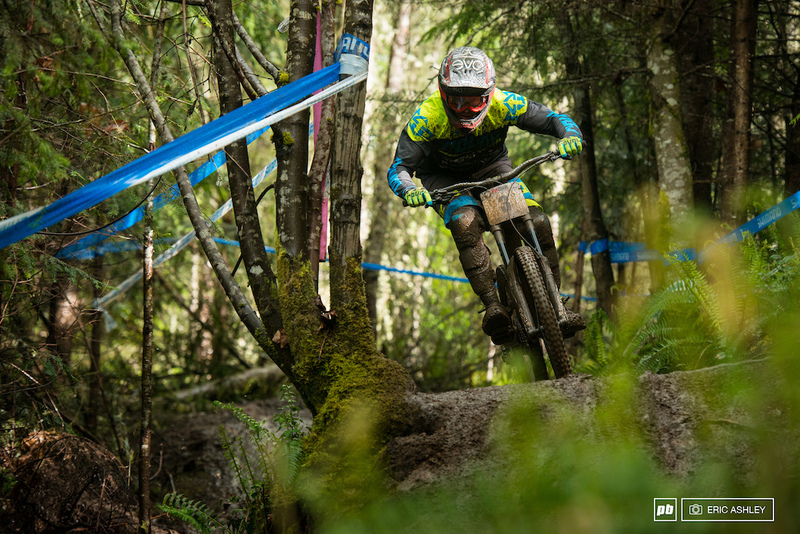 Transition's Lars Sternberg took some time for a little film session just six weeks after breaking both hands. 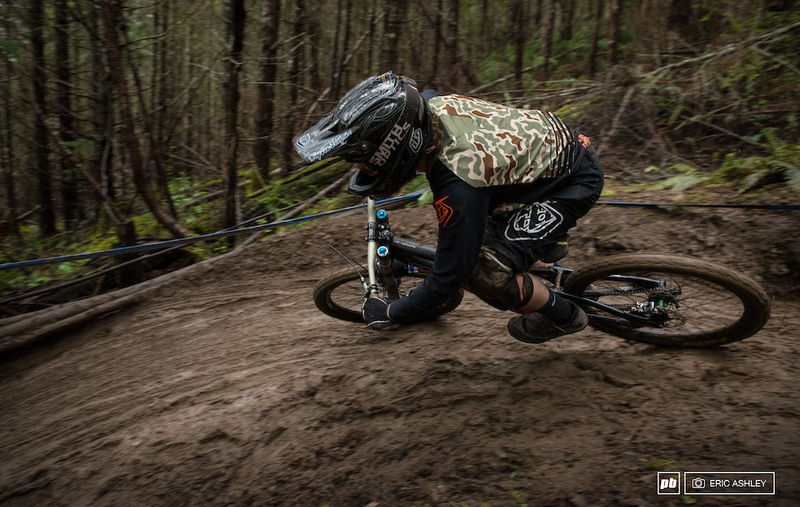 King Diamond gets things started off with an off camber pumping-roll, just to make sure you're handling your bike well. Archie LaBine (Cat 1 Men19-29). 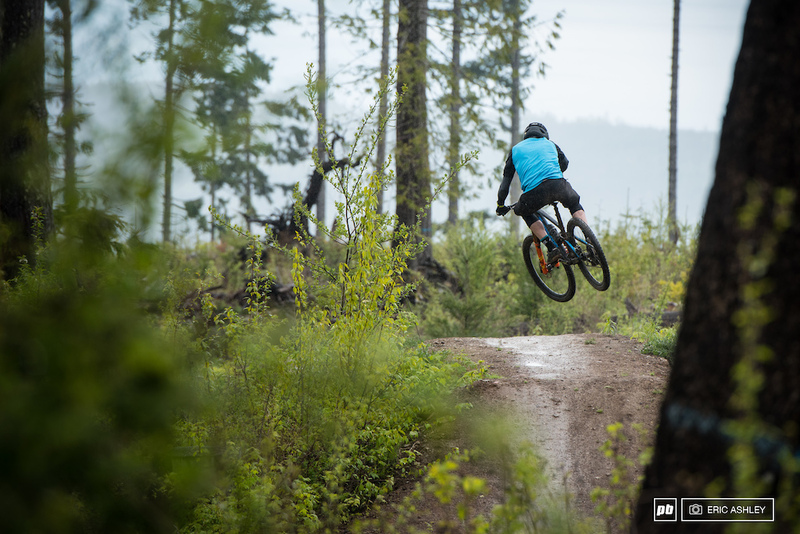 Ryan Hayles gets a little lift off in a new patch of trail called Rekluse (Cat 1 Men 30-39). Guns out and hopefully the sun comes out? Smokey makes his way through the muck. 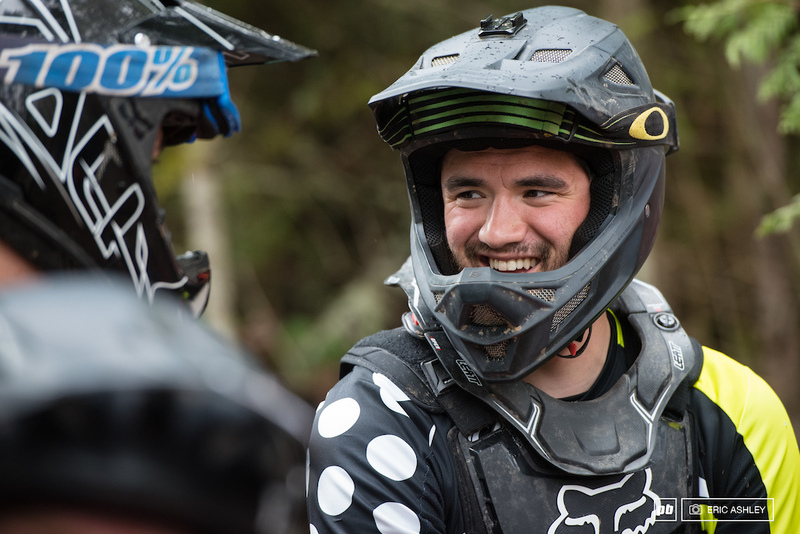 Blake Bunting came third during Saturday's seedings but was pushed back by Ben Wallace and finished fourth on Sunday (Cat 1 Men 0-18 ). 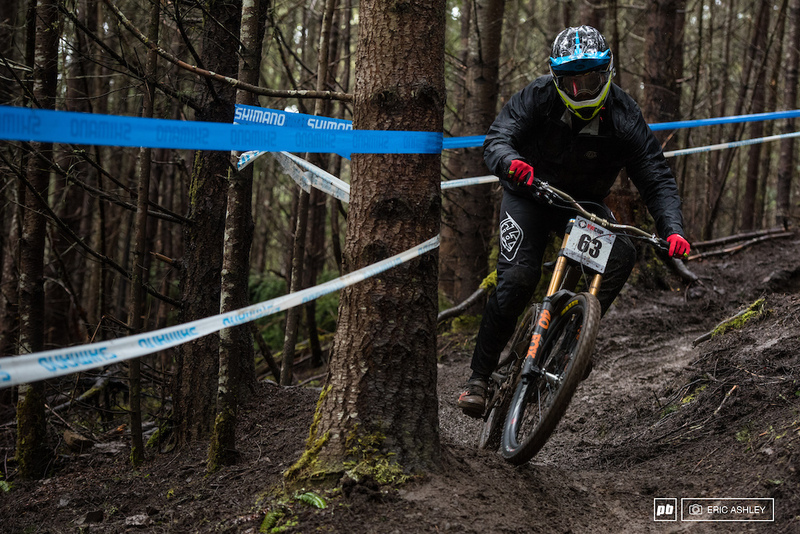 Kiran MacKinnon seeded third on Saturday and followed it up with a fifth-place finish the next afternoon (Pro Men). 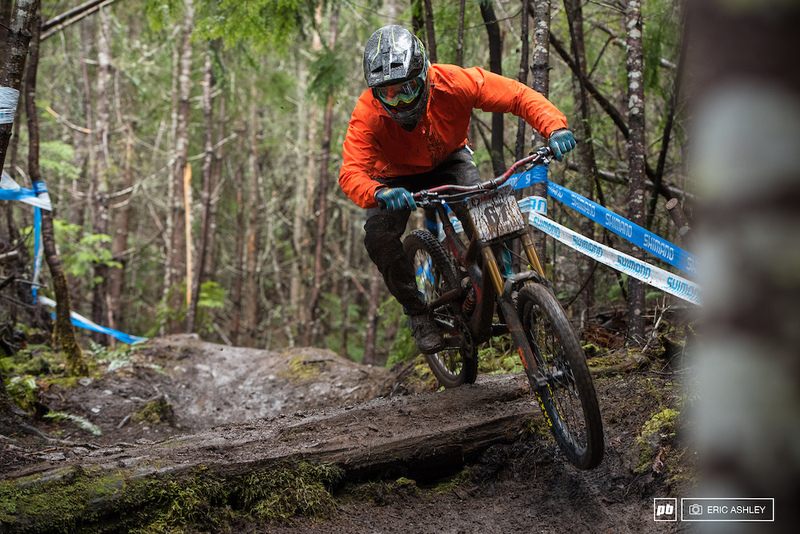 Zach Sedivy bombs toward the steep chute on King Diamond (Pro Men). 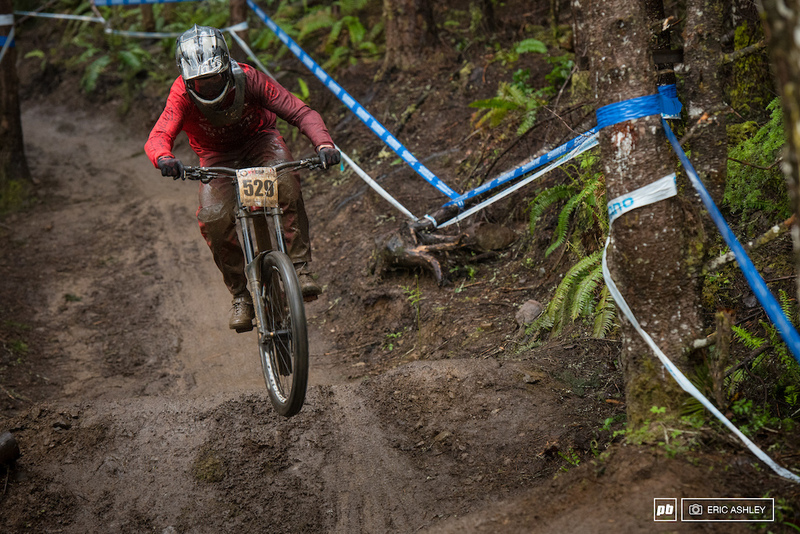 Back on her local course, Jill Kintner was unfazed by the weekend's volatile conditions (Pro Women). Lucas Cruz laid down a fast seeding run to position him at the front, but he lost ground to Ethan Shandro during the race (Cat 1 Men 0-18 ). 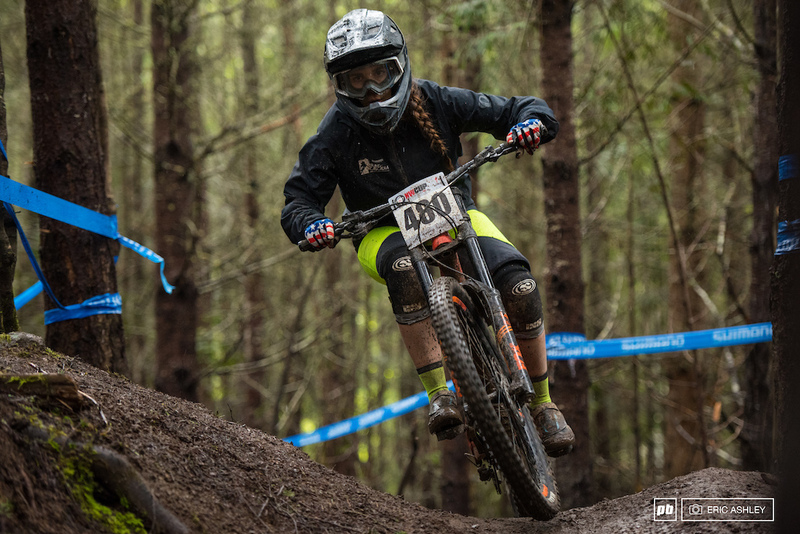 Vaea Verbeeck last raced at Dry Hill in 2015 where she placed fourth. 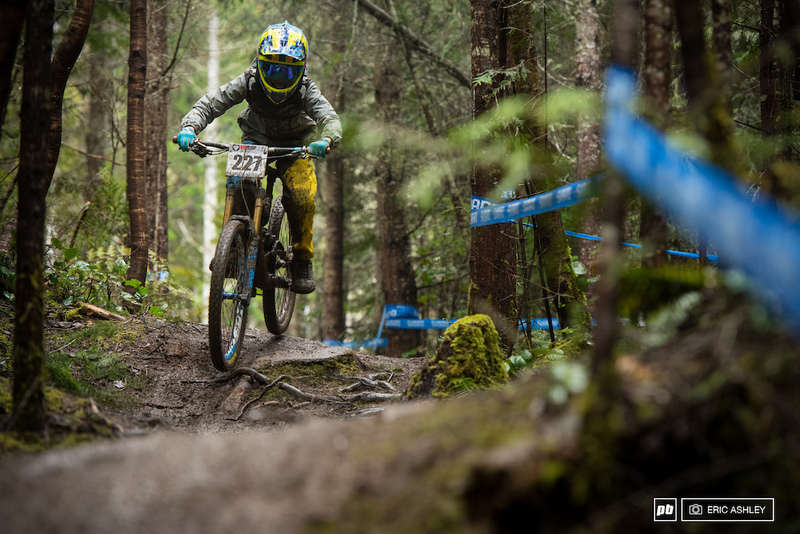 This year she took the second step of the podium (Pro Women). 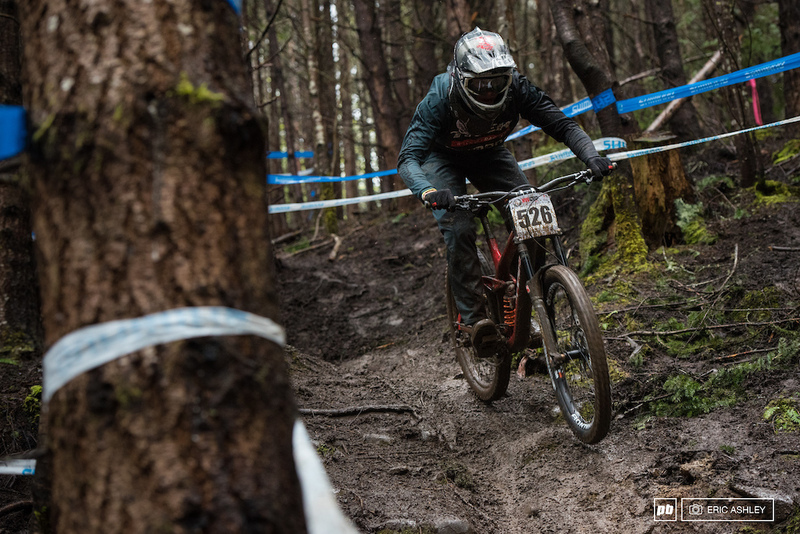 A disappointing weekend for Shane Leslie saw him end at the bottom of the pack (Pro Men). 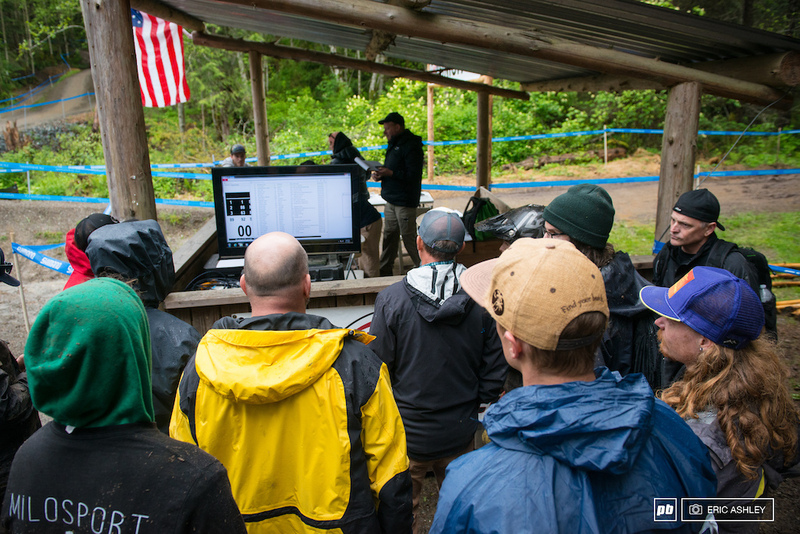 In many places on the Cat 1/Pro Course, things devolved into rut management. Steven Walton (Cat 1 Men 0-18 ). 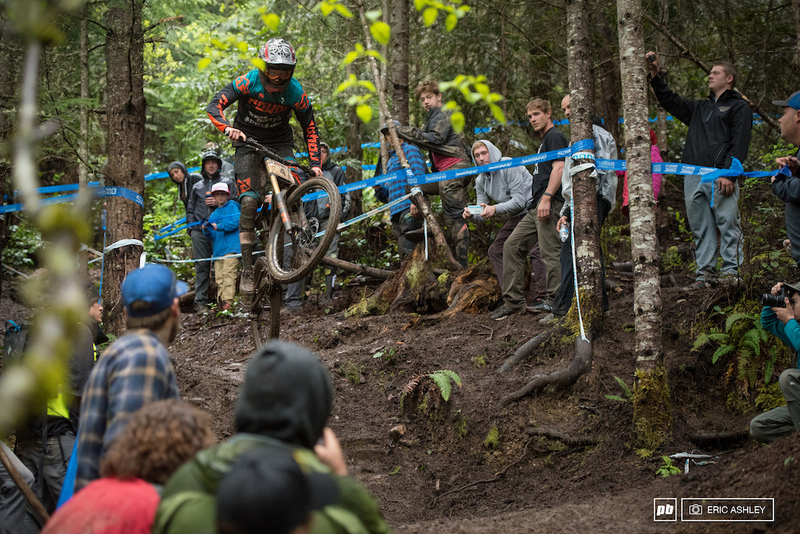 Jacob Stefiuk heads into Rekluse for what would have been a loamy dream under other circumstances (Cat 1 Men 0-18 ). 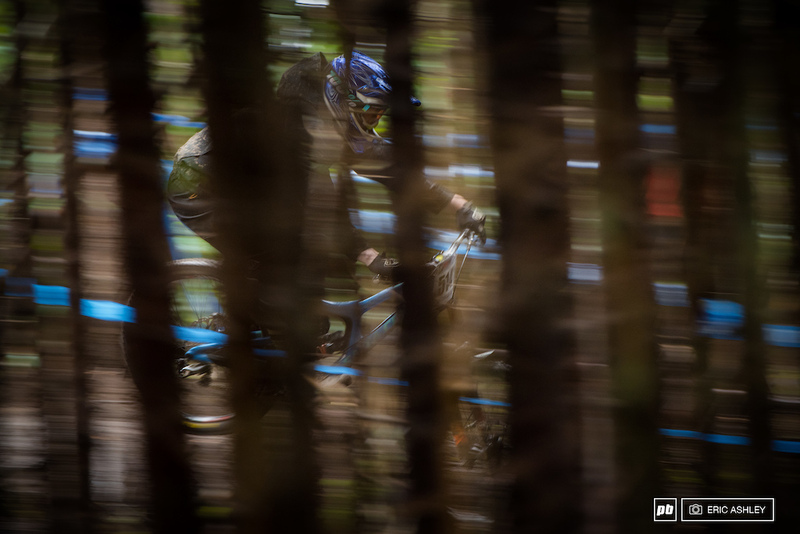 Luke Strobel throws down a local's special whip during the end of practice on Saturday (Pro Men). 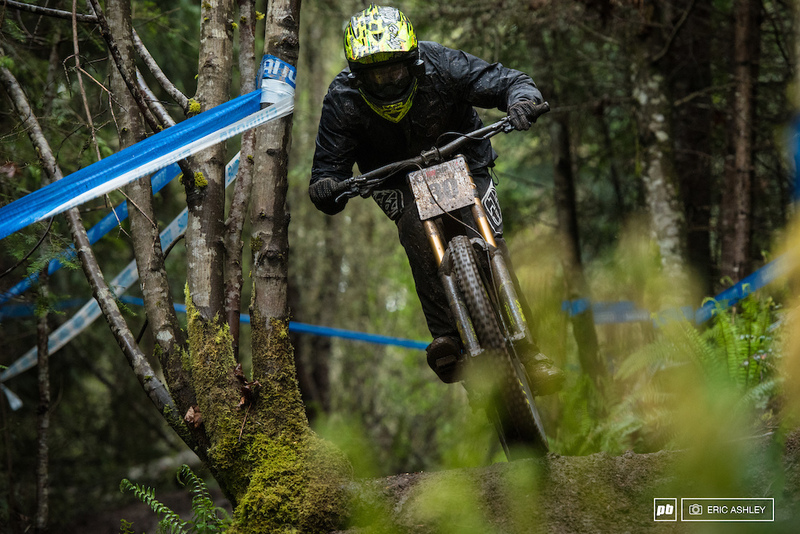 Devin Kjaer put in a solid seeding run to position him in second. On Sunday Kjaer lost just a fraction of time to take the last step on the podium (Cat 1 Men 0-18 ). Blake Bunting delivered consistent times to take third in both his seeding and race runs (Cat 1 Men 0-18 ). 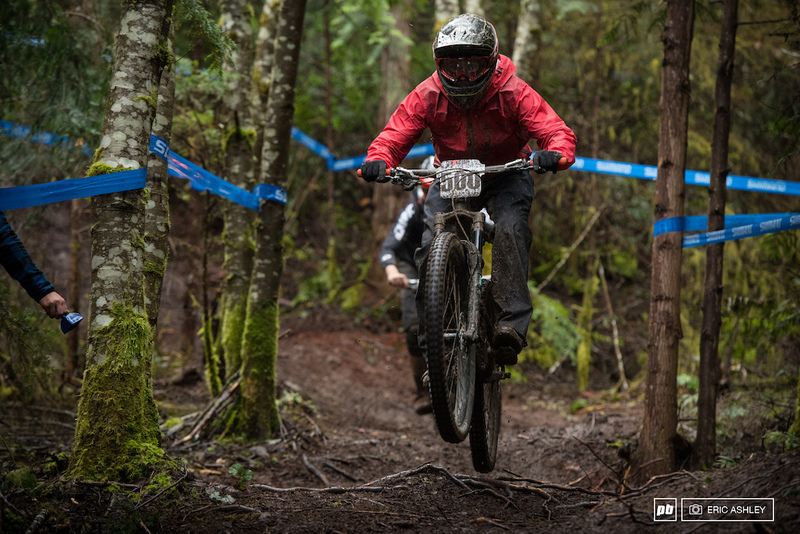 Back from a win at the first NW Cup, Australia's Danielle Beecroft put in a solid time to take third (Pro Women). 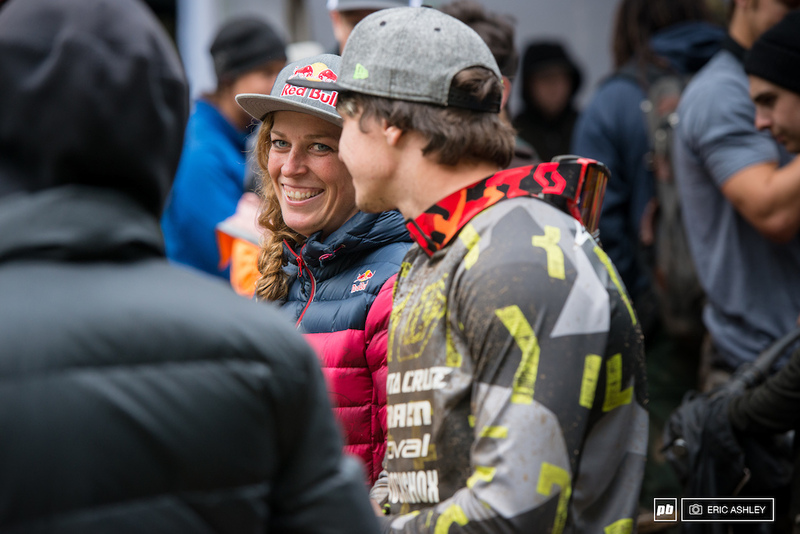 Jill Kintner's seeding run saw her over four seconds up (Pro Women). 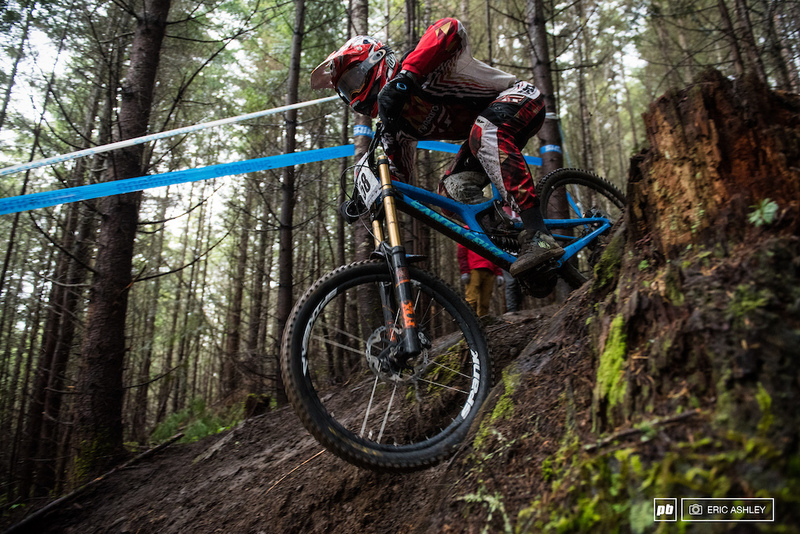 Alex Willie heads through the smooth section of Chunder Dome (Pro Men). 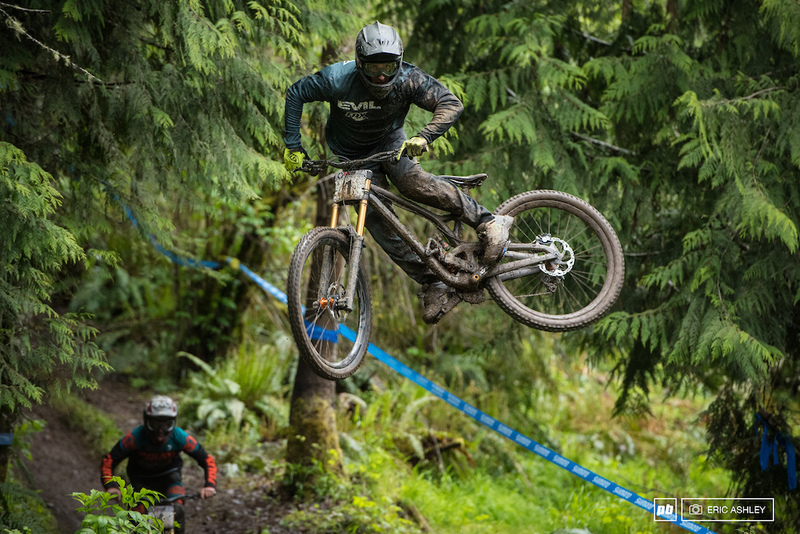 Transition evo Race Team's Jake Grob sends the iconic Waterfall on lower Chunder Dome (Pro Men). Luke Strobel set the pace on Saturday with a time of 2:37.84 (Pro Men). 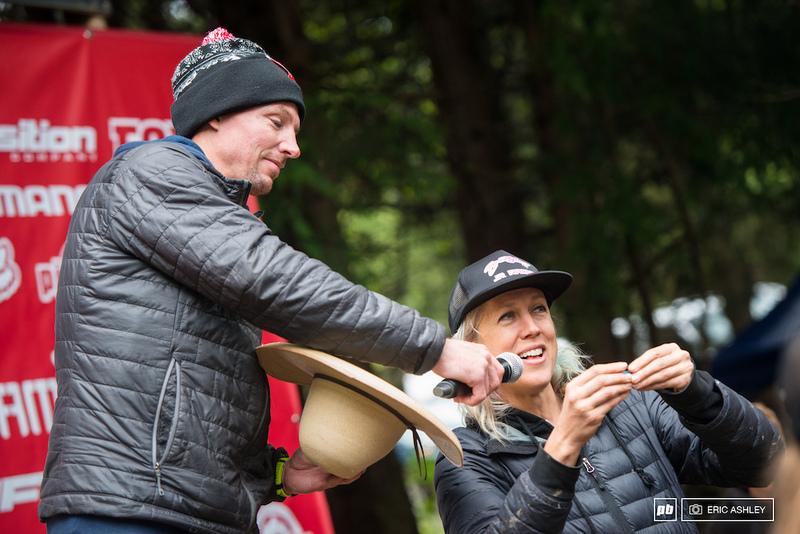 Although this year's race didn't include qualifiers there was still a press around the results to see where the top finishers landed. 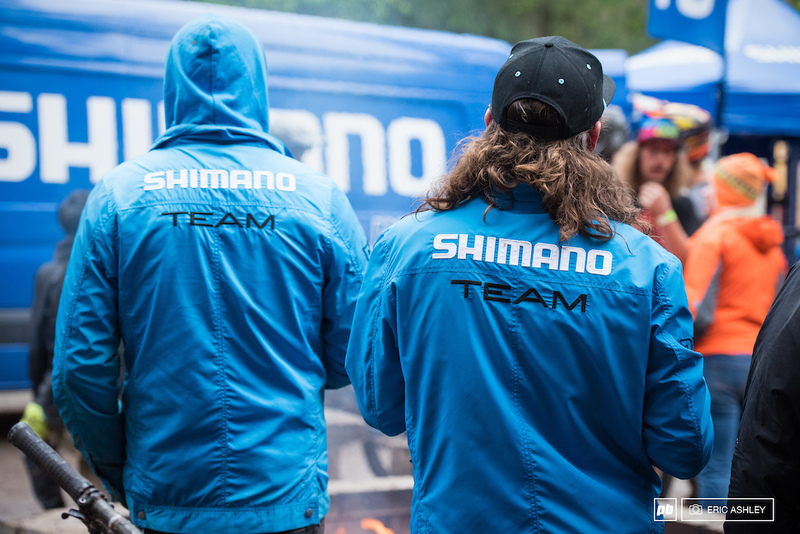 The Shimano Team takes a well-earned break to enjoy a beer and the fire after a long day of keeping rider's bikes working. The road gap at the start of the Cat 2 and Cat 1 Course is quite the sender if you can make the transition. 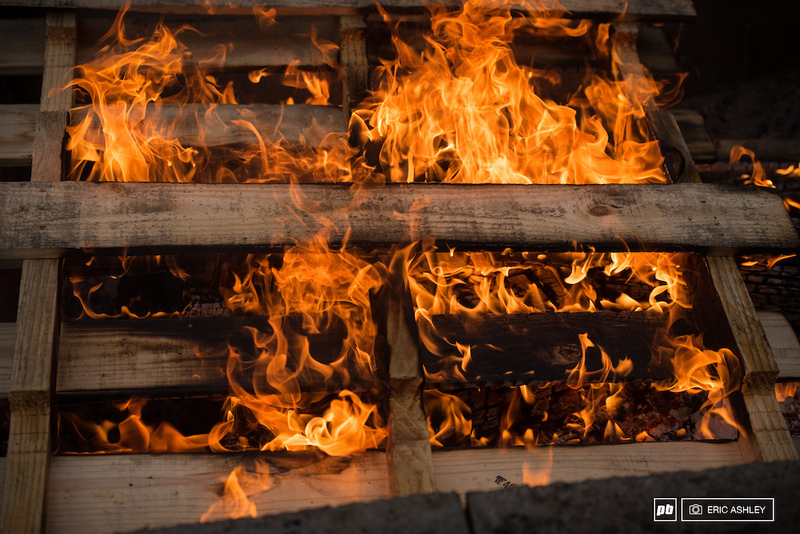 Start the morning off right with a little pallet fire. 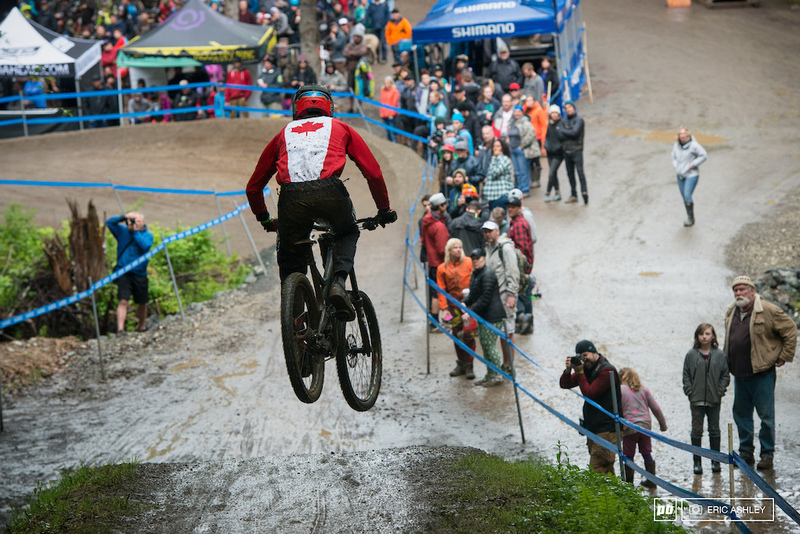 The majority of the Cat 3 course was tight turns and and steeps, with the exception of this huck to flat. Jake Webber (Cat 3 Men 15-18 ). 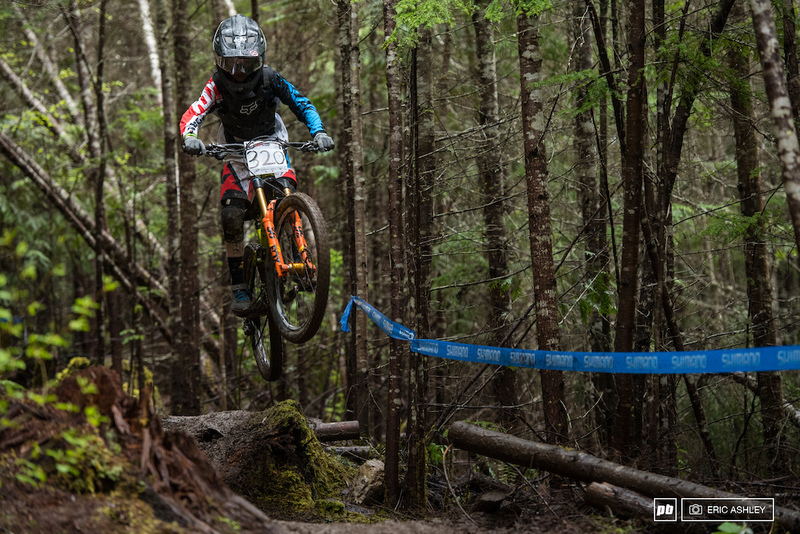 There was a lot of flair being thrown around by some young rippers as they raced down White Knuckle. Jagger Bucy (Cat 3 Men 11-14). Sierra Semsak led the charge and took first (Cat 3 Women 0-10 ). Needless to say, no one came down course looking remotely clean. Short Shorts is dominated by some pretty tight corners, but there's still some air to catch if you know where to look for it. Ben Aton (Cat 2 Men 30-39). 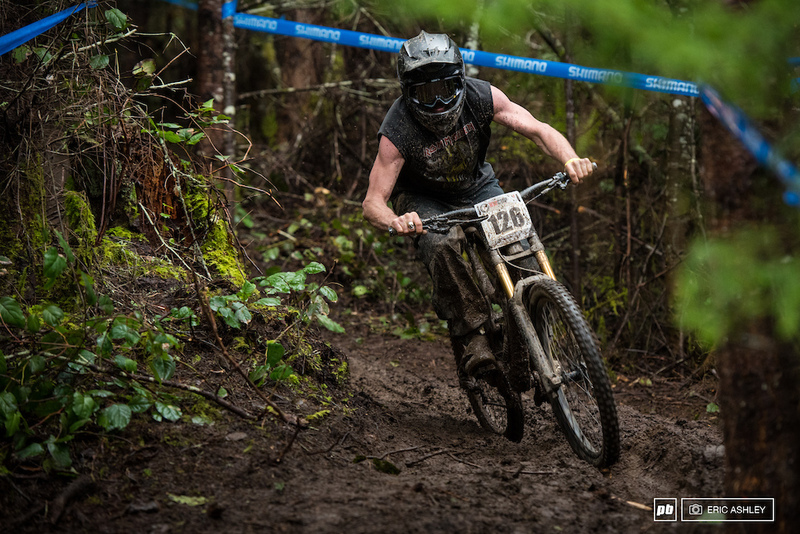 Jason Franz had a good day and carried the win against nearly 30 competitors (Cat 2 Men 40-49). Wayne's World is one part natural playground and one part sculpted fun. Ian Rudd (Cat 2 Men 50+). 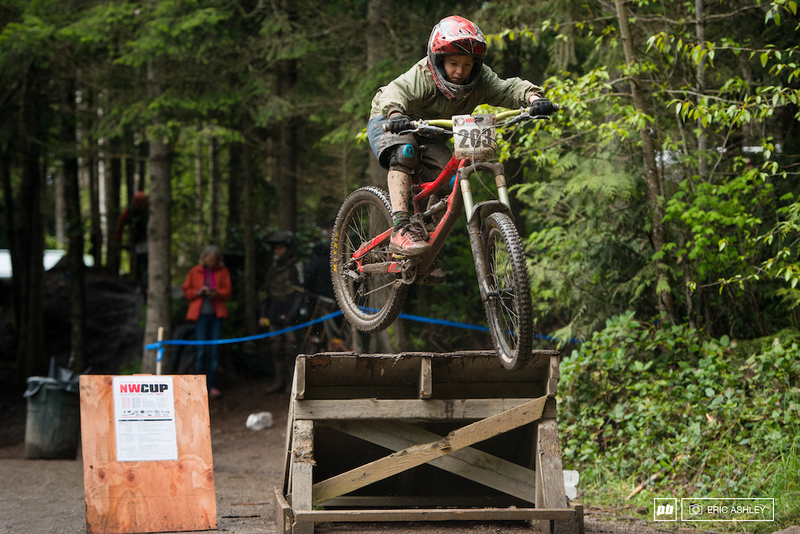 Andrea Johnson rides through the top section of Wayne's World (Cat 2 Women 40+). 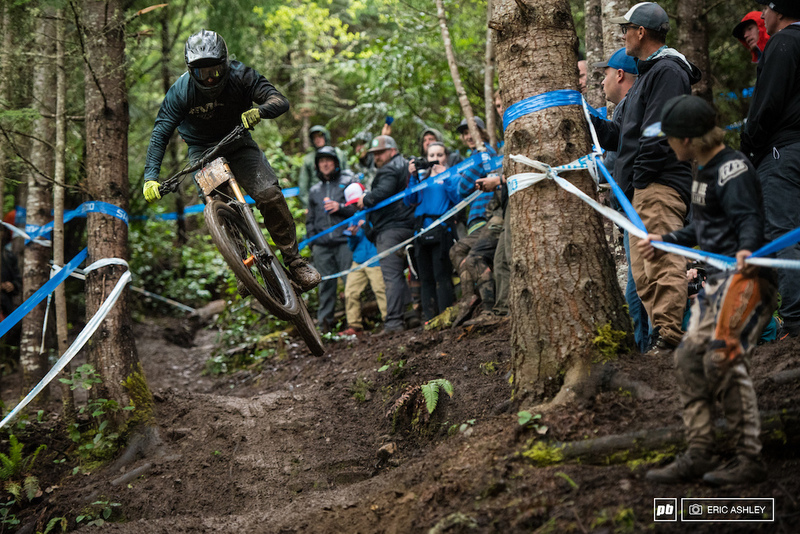 Jackson Goldstone (Cat 2 Men 0-14) sends a muddy step-down on Wayne's World on the way to the top of the podium for the second time this year. Watch out! 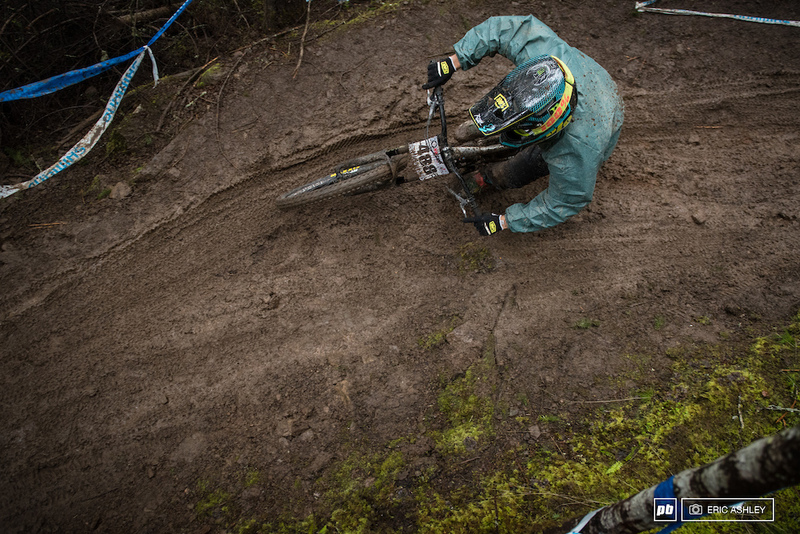 Some of the berm foundations worked their way to the top under the onslaught of racers. Marc Soelberg waiting above the start gate (Cat 1 Men 19-29). Yannick Mets (Cat 1 Men 19-29) rushes by, en route to the road gap. 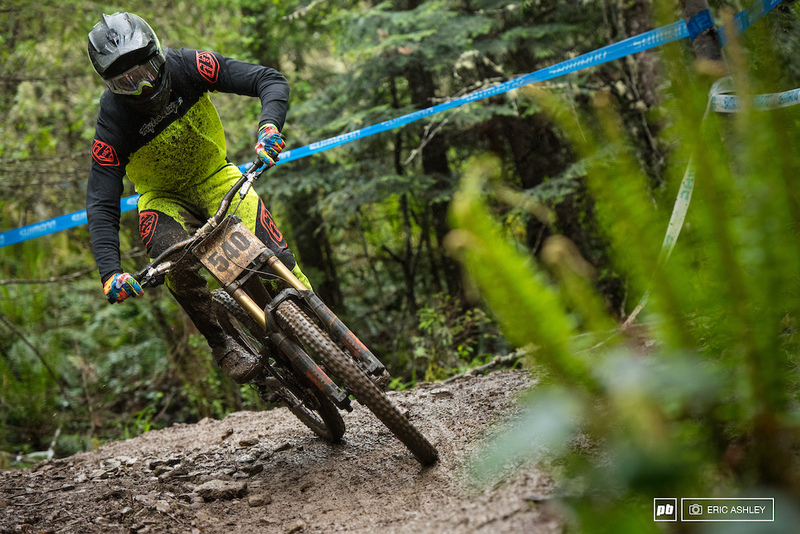 Austin Warren was on point Sunday and moved up from a ninth-place seeding to take third ahead of Luke Strobel (Pro Men). 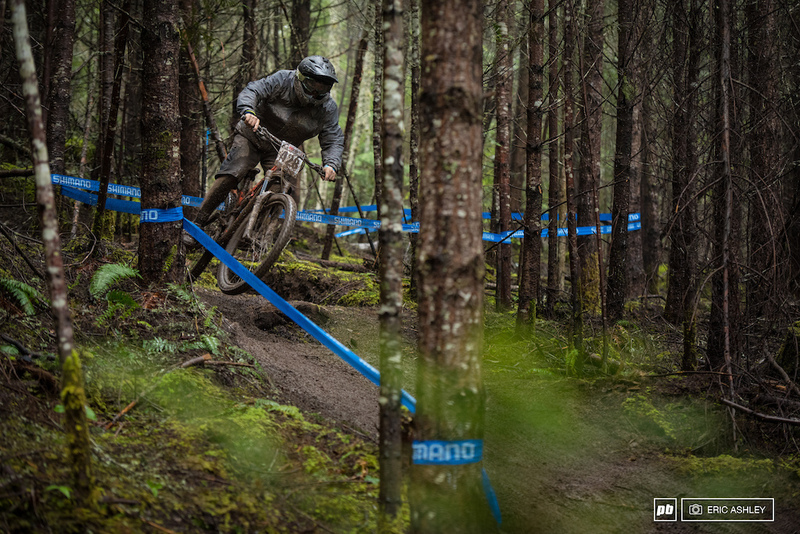 Magnus Manson landed outside of the top ten for seedings but he pulled out the speed on Sunday to net second (Pro Men). Ethan Lieb navigates a steep, loose, and chunky chute on King Diamond (Cat 1 Men 0-18 ). Ben Wallace and Lucas Cruz. Cruz was pushed out of first by teammate Ethan Shandro and Wallace took third (Cat 1 Men 0-18 ). Ethan Shandro found a burst of speed on Sunday and cut just over six seconds on the way to first (Cat 1 Men 0-18 ). 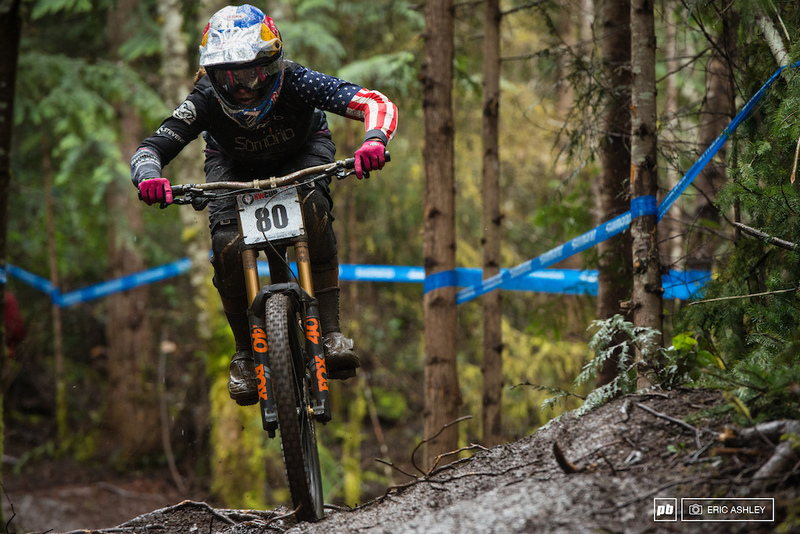 Tear-offs, mud and rain management, and precise riding were Jill Kintner's recipe for a winning finish (Pro Women). Kialani Hines and Danielle Beecroft snagged fourth and third. 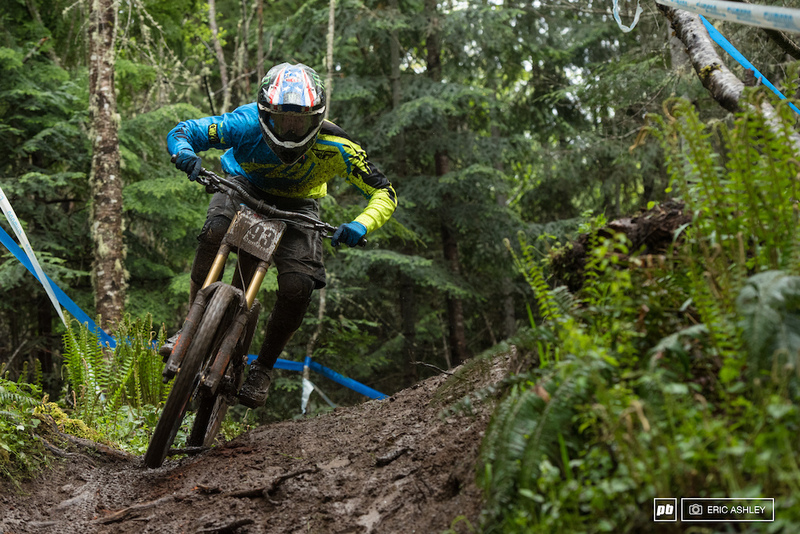 Hines returned to the NW Cup after an injury took her out last season (Pro Women). Good times by the bucket load helped racers down the hill. 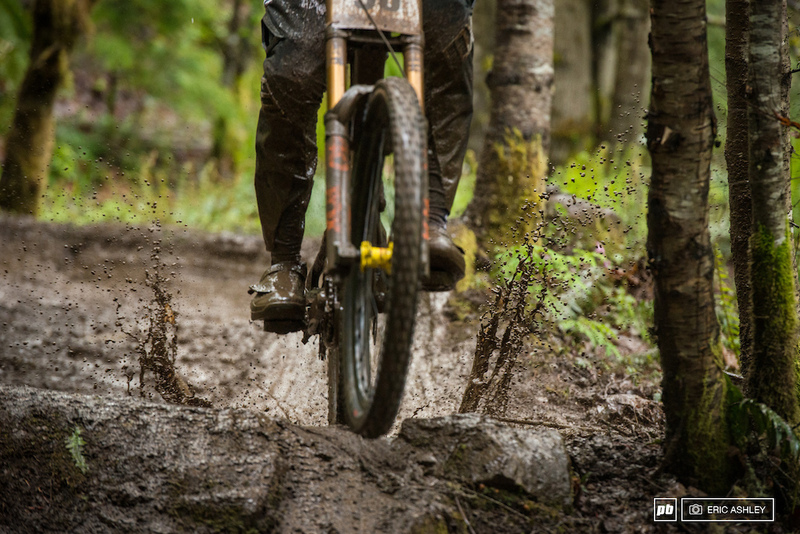 By the time Juniors and Pros dropped in, the mud was relentless. 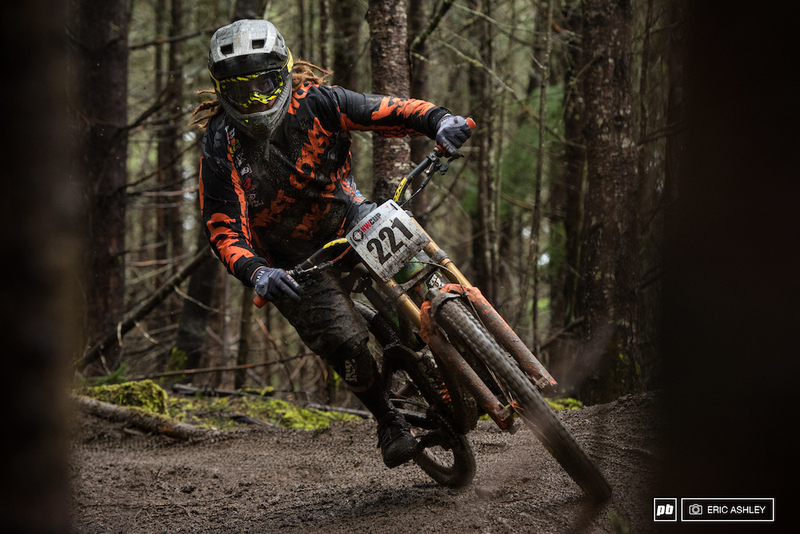 Jesse Ransavage (Pro Men). 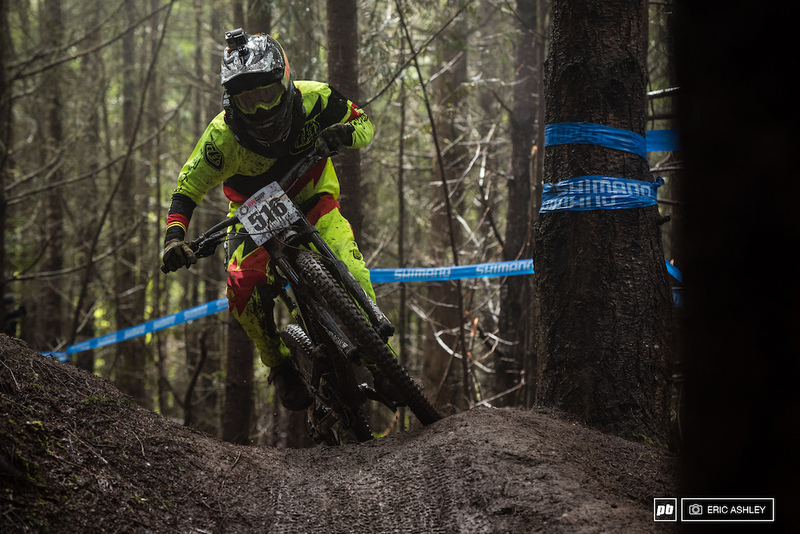 Matt Orlando looking for speed on Chunder Dome (Pro Men). Mitch Ropelato moved up five spots to secure first with a time of 2:35.37 (Pro Men). 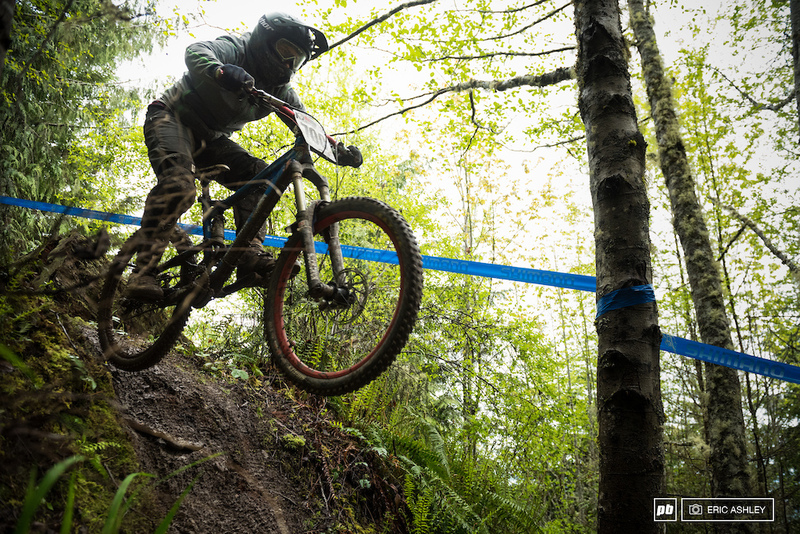 Kirk McDowall soars into the staging area two seconds behind the lead, landing him in seventh (Pro Men). 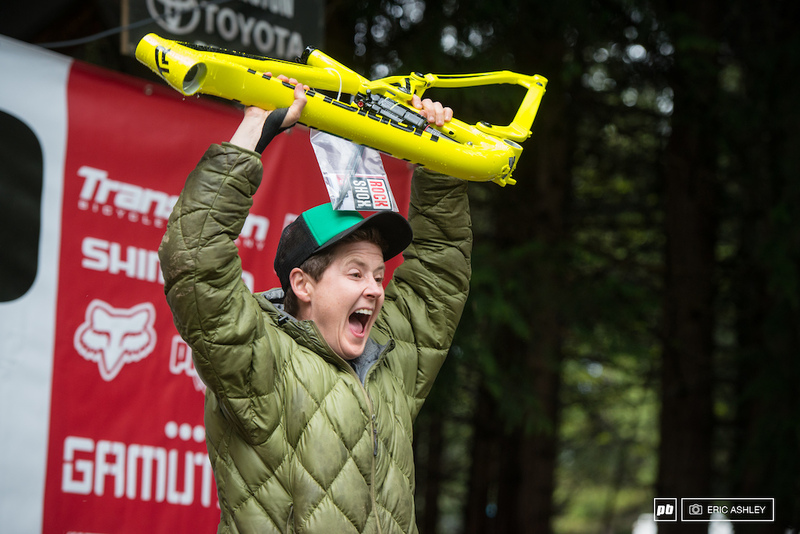 Luke Strobel's lead didn't hold, landing him in fourth place for the second time this year (Pro Men). In honor of Mother's Day, Transitions was on site to raffle a new frame. Lars Sternberg and Kat Sweet. A very stoked Karen O'Connell took home this beauty. Checking the footy for the nugs. With a little down time and an unsupervised loading ramp you have the means for an impromptu huck fest. Cody Parsons (Cat 3 Men 11-14). Junior Podium: Ethan Shandro, Lucas Cruz, Ben Wallace, Blake Bunting, and Devin Kjaer. 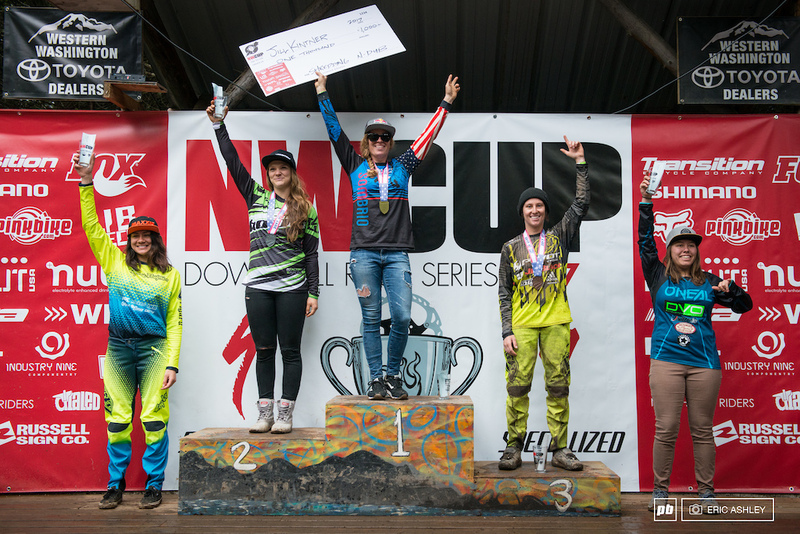 Pro Women Podium: Jill Kintner, Vaea Verbeeck, Danielle Beecroft, Kialani Hines, and Samantha Kingshill. 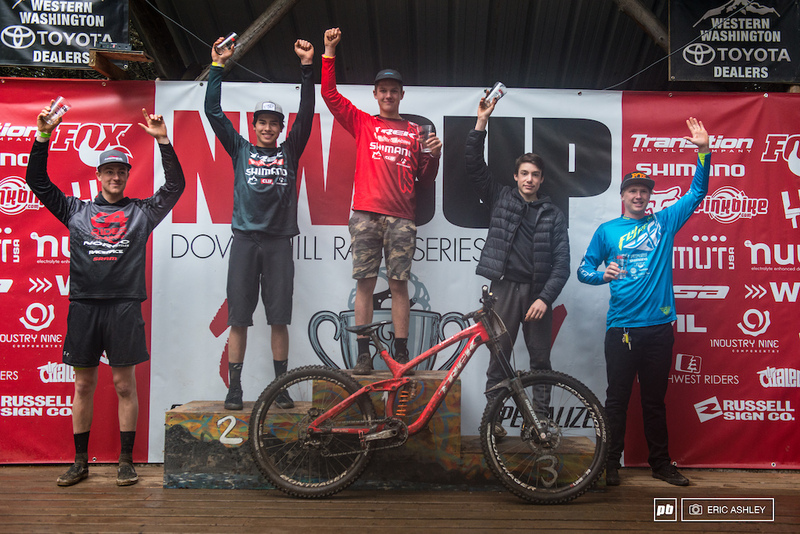 Pro Men Podium: Mitch Ropelato, Magnus Manson, Austin Warren, Luke Strobel, and Kiran MacKinnon. "It was a little splashy, a little monsoony. But this is my local spot, so it treats me well most of the time." 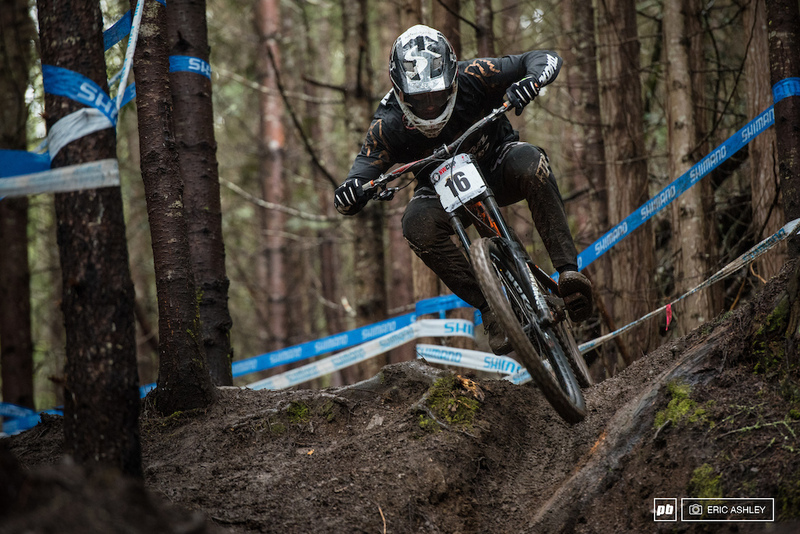 Jill Kintner (Pro Women). "That's the mystery right now. If I put the runs back to back in my head I felt like I pushed the same on both runs. So where those extras seconds were made up, I don't know." 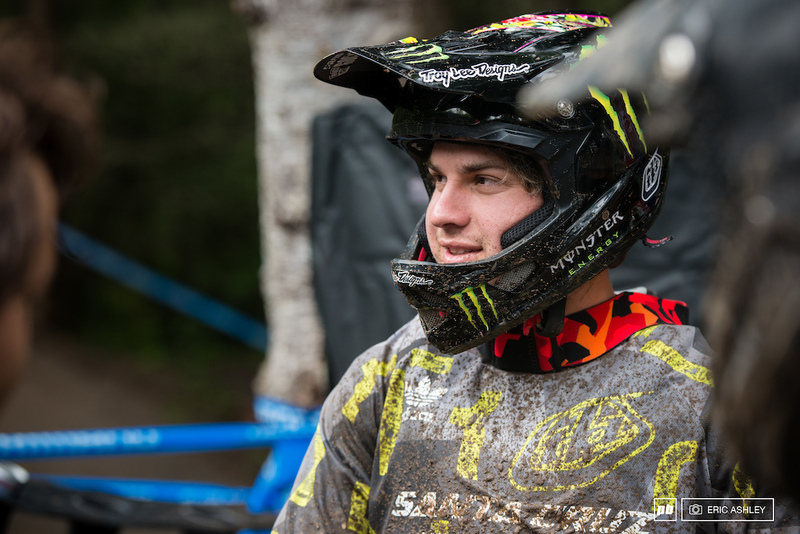 Mitch Ropelato on his surge of speed during the race (Pro Men). Up next, Ropelato heads home for a favorite local race in Utah. 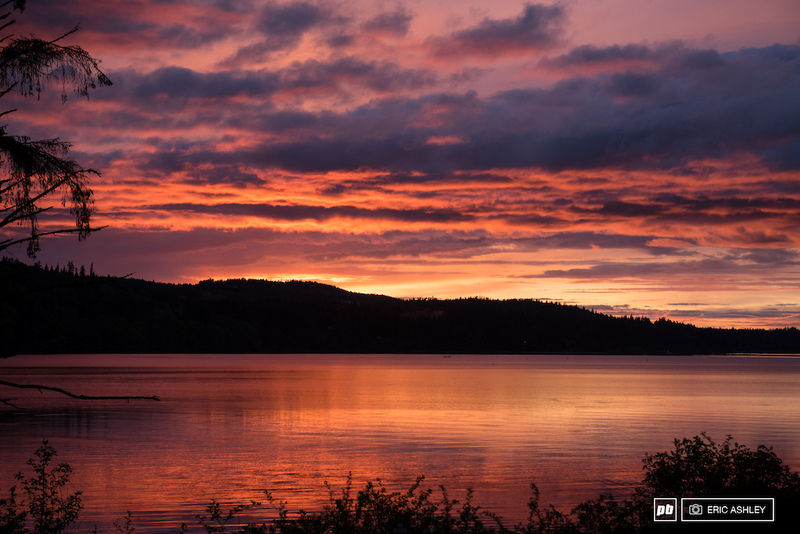 That's a wrap from "Always Sunny Port Angeles." @ericashley thanks for all the hard work you put in covering the local race scene. Couple of locals in the top six! @MX298: yet no mention of Carson there.. Saw a Subaru with what might have been a downhill bike and barely visible number plate back in town (Seattle) on Sunday afternoon. The bike was completely unrecognizable and covered in the brown-and-sticky. 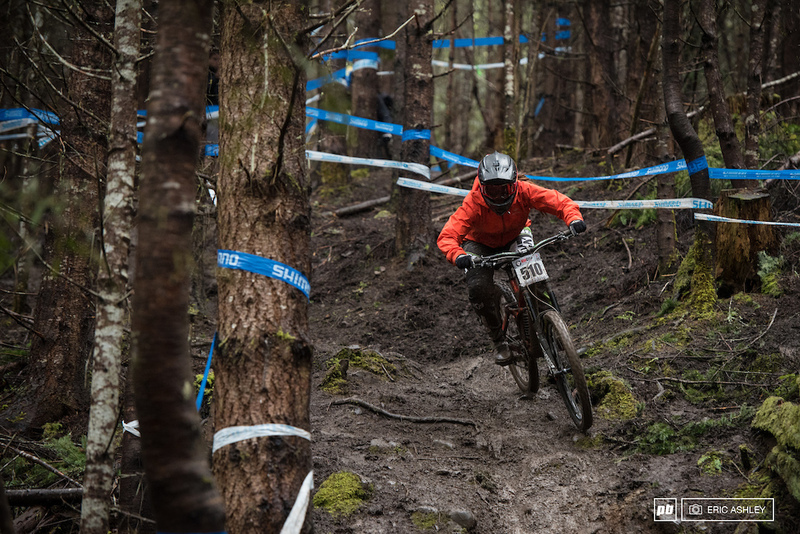 Great write up, course looked gnarly! 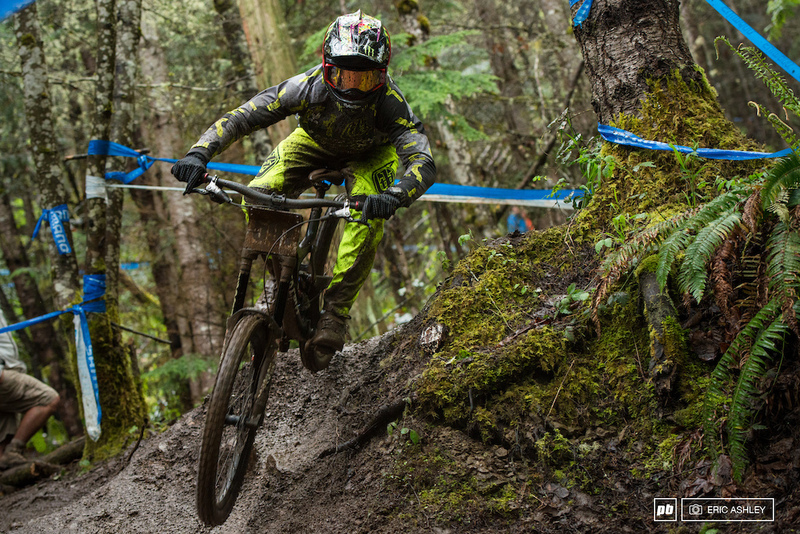 Stoked to see Cole Suetos getting 14th in Juniors, while basically riding mud for the first time! Great weekend but you make it look even better in the race report! 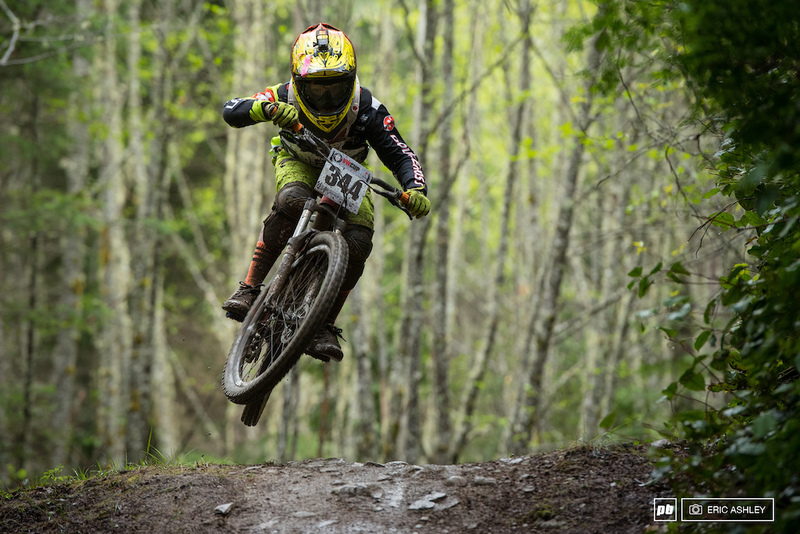 Loam is dirt people! 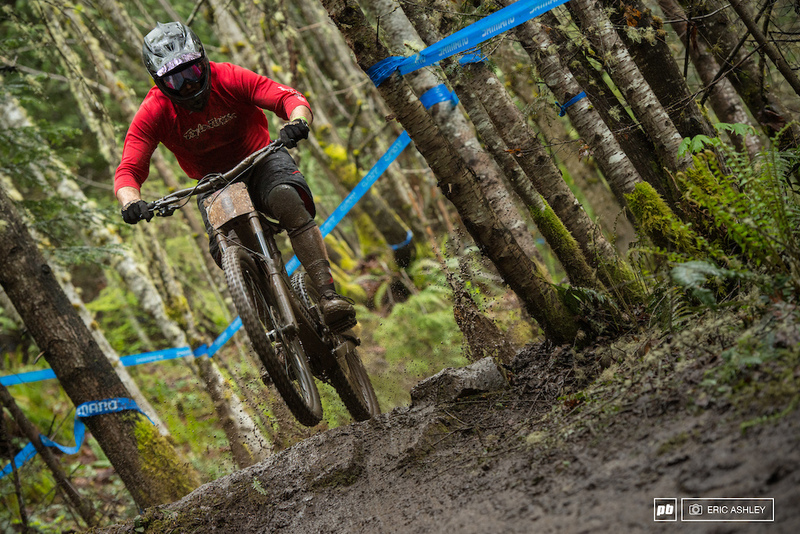 Not sure why the entire bicycle world is stuck on calling fresh cut trails still covered in duff and tree litter loam. Loam is a near equal 1/3rd mix of sand, silt and clay. Look it up! Let this one go, atleast the bike community isn't running around with soil charts to determine best wheel size for organic material to sand ratios. 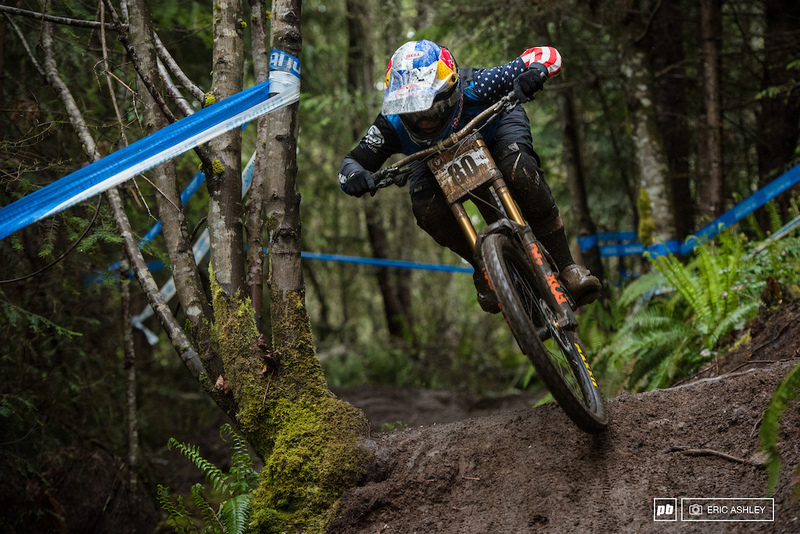 Yea you are correct, what mtb'rs call loam isn't loam. But we also needlessly argue about more mundane things than that -we aren't a reasonable bunch and certainly don't have time for that one. 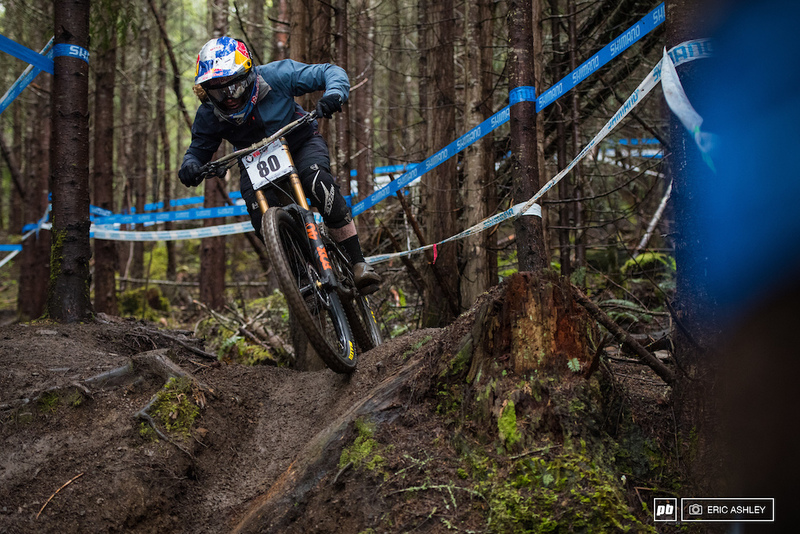 When we say "loam" everyone knows what that means ... so let it slide. Favorite race all year! Had a blast. Is the riders name really Pownall?? I read that as Johnny pwns all. Pretty good name for a racer! I hope Mitch gives the world cups another go..
Oh' Schmitt !!! West Coast !!!!! 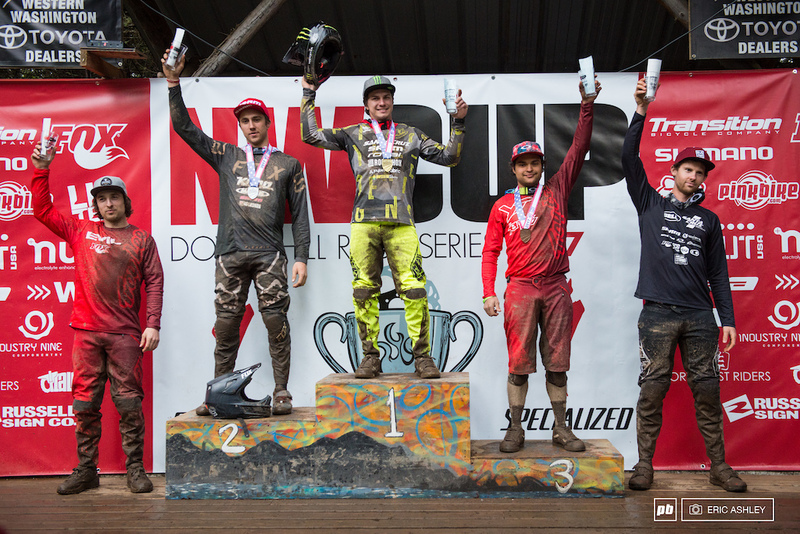 Another great race in the nw cup! Fantastic weekend! Great event, great write up, thanks everyone involved! You can drive a uhaul truck up it,I don't see why it wouldn't be considered a road. Does it have to be a two lane highway with shoulders to be considered a road gap,since you saw it in a movie once? And my original comment was rhetorical...this isn't a proper road gap, so if that's a point you are trying to argue, let me save you some time.